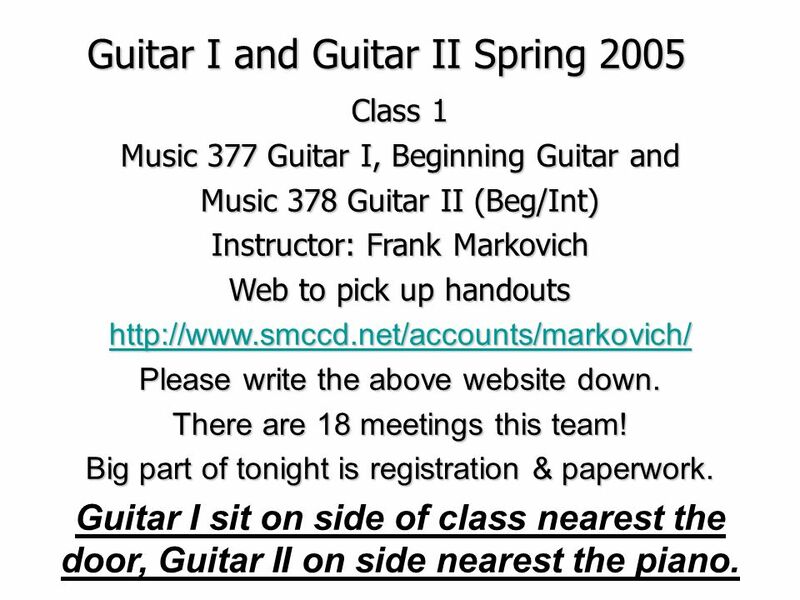 1 Guitar I and Guitar II Spring 2005 Class 1 Music 377 Guitar I, Beginning Guitar and Music 378 Guitar II (Beg/Int) Instructor: Frank Markovich Web to pick up handouts http://www.smccd.net/accounts/markovich/ Please write the above website down. There are 18 meetings this team! Big part of tonight is registration & paperwork. Guitar I sit on side of class nearest the door, Guitar II on side nearest the piano. 2 Have 2 helpers tonight Frankie and Ansgar will be helping tonight. Would like Guitar II students to also help beginners tonight! They will tune your guitars, help with passing out material and work with you on hand position etc. They will handle the paperwork for all students adding the class. Both are more advanced students and have helped in the past. Guitar II students will also be helping from time to time. Also if any of you are interested in scholarships email me and I will forward the information off to you from the administration. I will be going through the first slides quickly. 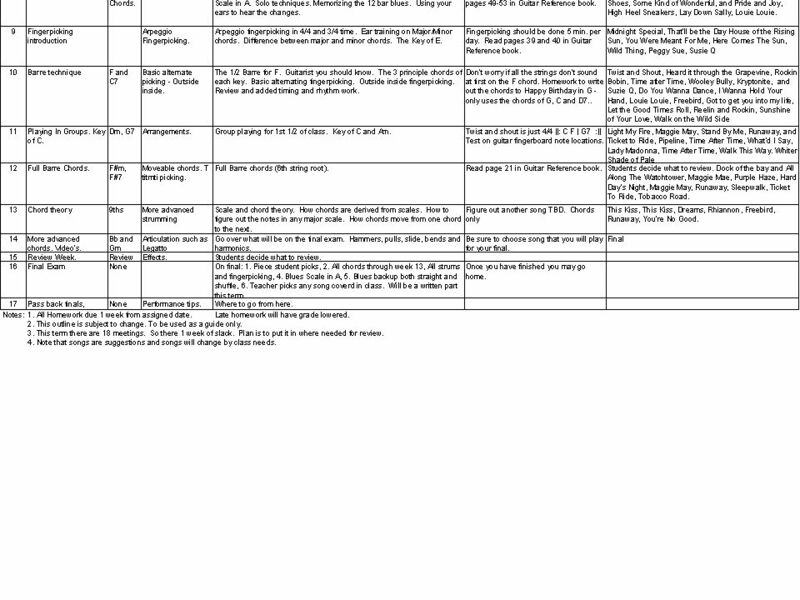 All of this information is on the web page and can be reviewed there. I would rather get right to playing as quickly as possible. 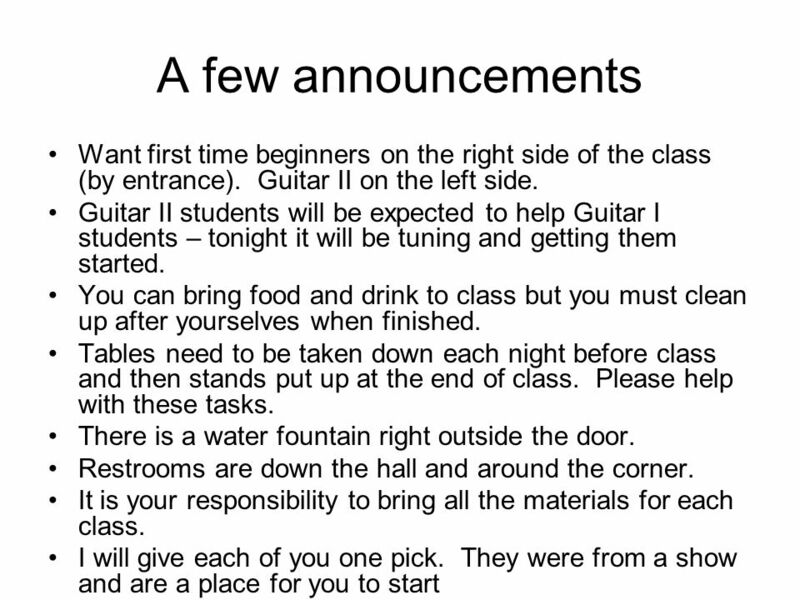 Beginners will go home early tonight (8:30) Guitar II students will stay until 9:30 or so. 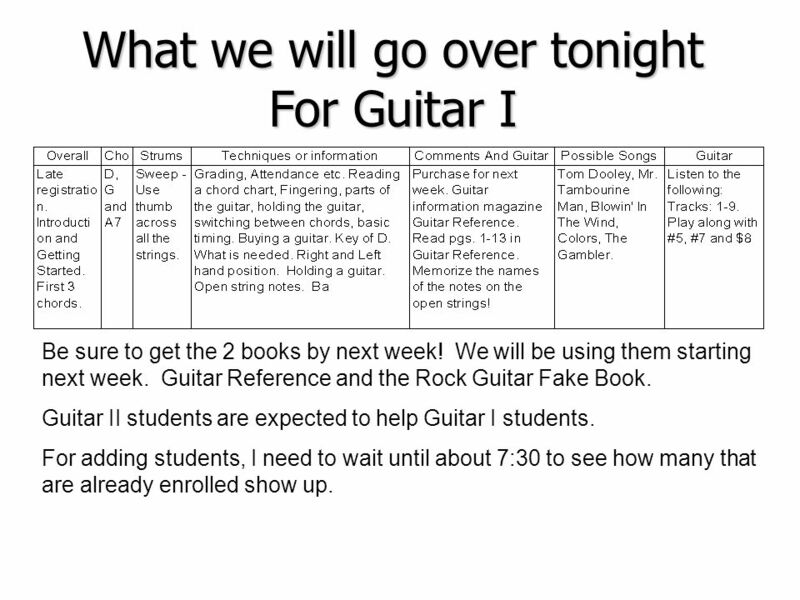 We will take a break when Guitar I students leave for the night. 3 What we will go over tonight For Guitar I Be sure to get the 2 books by next week! We will be using them starting next week. Guitar Reference and the Rock Guitar Fake Book. 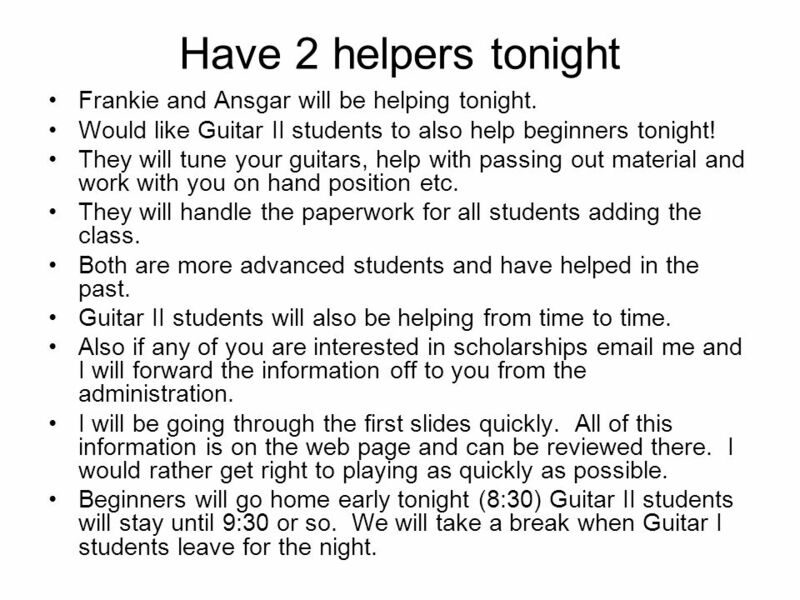 Guitar II students are expected to help Guitar I students. For adding students, I need to wait until about 7:30 to see how many that are already enrolled show up. 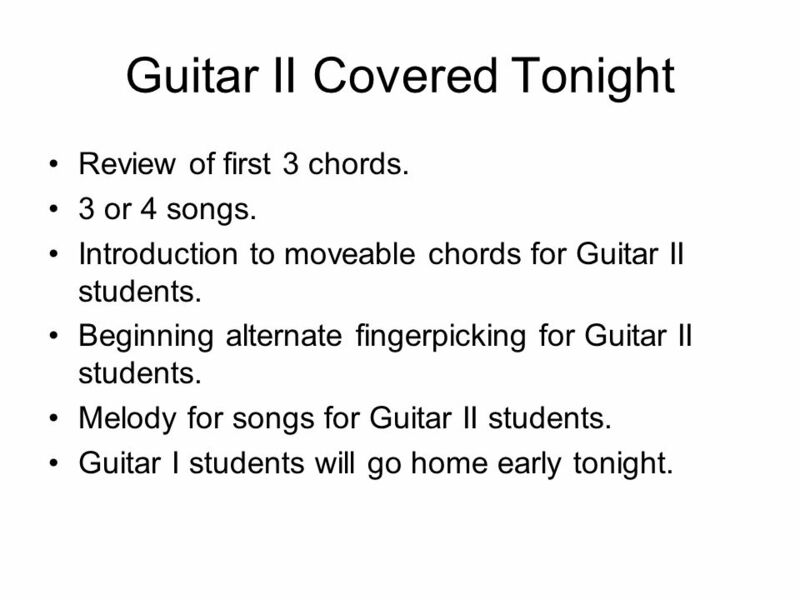 4 Guitar II Covered Tonight Review of first 3 chords. 3 or 4 songs. Introduction to moveable chords for Guitar II students. 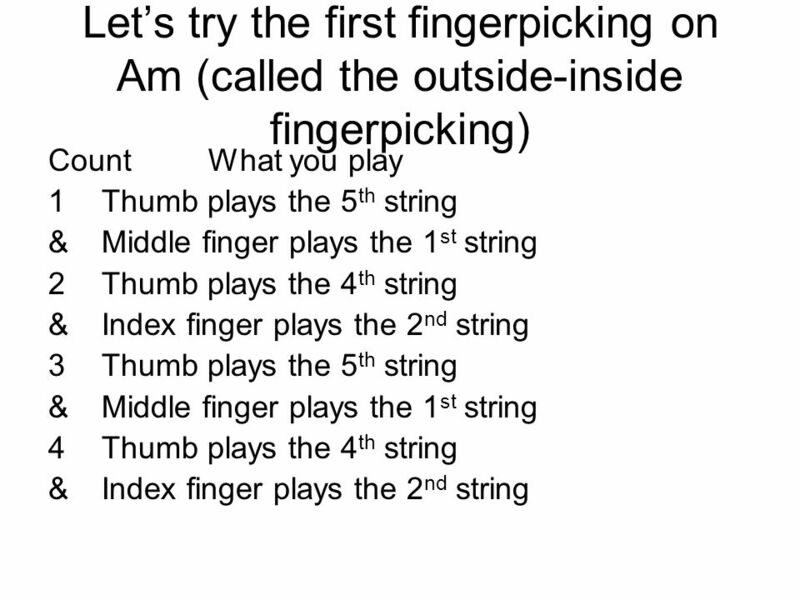 Beginning alternate fingerpicking for Guitar II students. Melody for songs for Guitar II students. Guitar I students will go home early tonight. 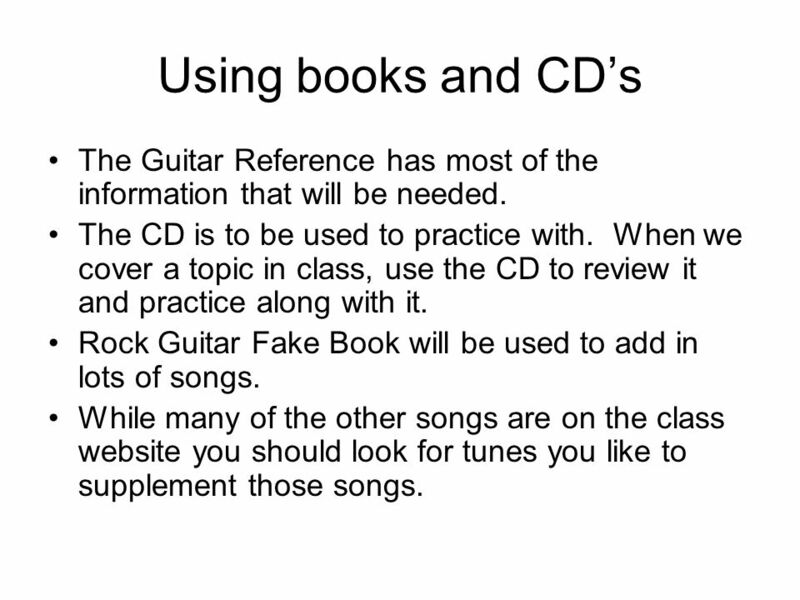 5 Using books and CDs The Guitar Reference has most of the information that will be needed. The CD is to be used to practice with. When we cover a topic in class, use the CD to review it and practice along with it. Rock Guitar Fake Book will be used to add in lots of songs. While many of the other songs are on the class website you should look for tunes you like to supplement those songs. 6 Attendance – grading etc. Grading will be based upon the following: 35% attendance, 30% on class playing, homework, quizzes etc. and 35% on the final exam. There will be no midterm test. The only test is the final. See sheet on extra credit opportunities. The Final will be performance only. No written section on the final but quizzes can be performance or written. 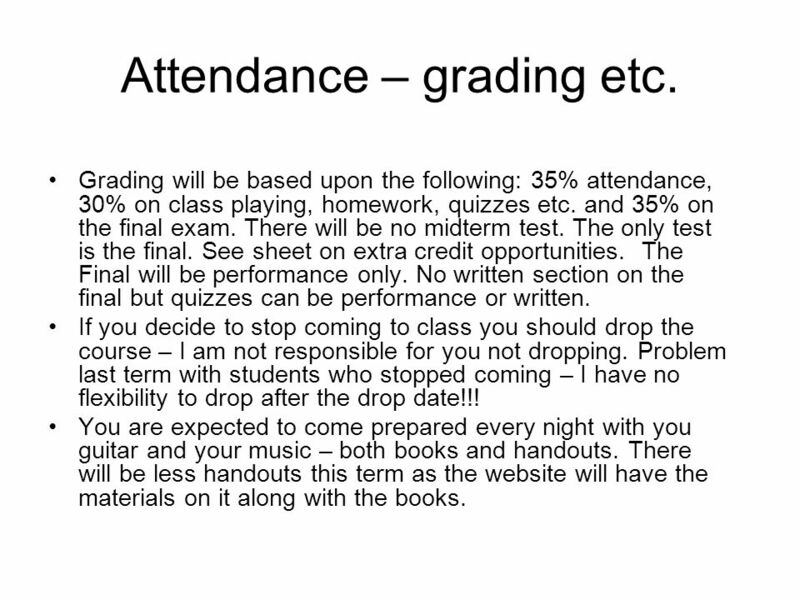 If you decide to stop coming to class you should drop the course – I am not responsible for you not dropping. Problem last term with students who stopped coming – I have no flexibility to drop after the drop date!!! You are expected to come prepared every night with you guitar and your music – both books and handouts. There will be less handouts this term as the website will have the materials on it along with the books. 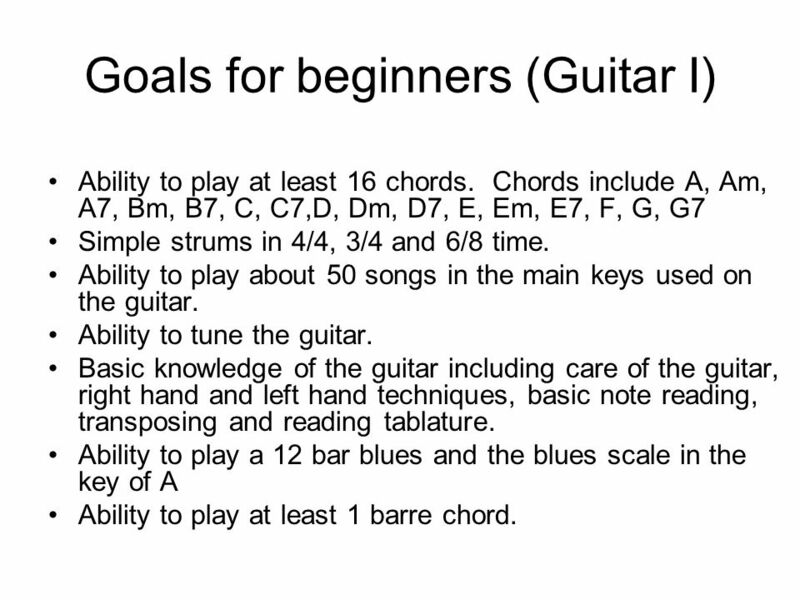 7 Goals for beginners (Guitar I) Ability to play at least 16 chords. Chords include A, Am, A7, Bm, B7, C, C7,D, Dm, D7, E, Em, E7, F, G, G7 Simple strums in 4/4, 3/4 and 6/8 time. Ability to play about 50 songs in the main keys used on the guitar. Ability to tune the guitar. 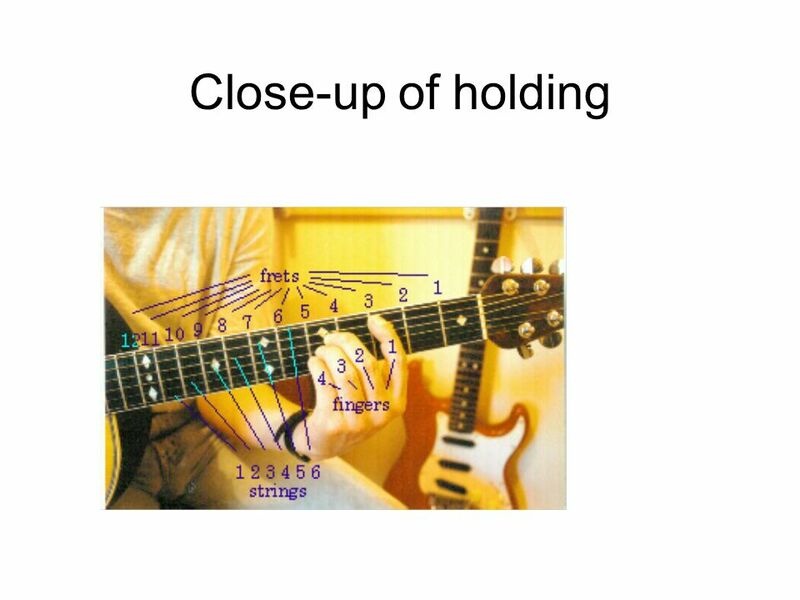 Basic knowledge of the guitar including care of the guitar, right hand and left hand techniques, basic note reading, transposing and reading tablature. Ability to play a 12 bar blues and the blues scale in the key of A Ability to play at least 1 barre chord. 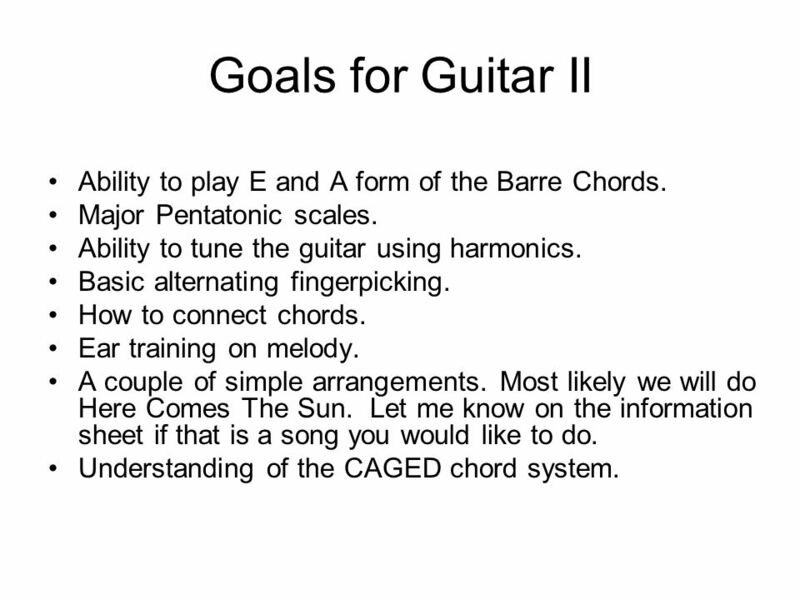 8 Goals for Guitar II Ability to play E and A form of the Barre Chords. Major Pentatonic scales. Ability to tune the guitar using harmonics. Basic alternating fingerpicking. How to connect chords. Ear training on melody. A couple of simple arrangements. Most likely we will do Here Comes The Sun. Let me know on the information sheet if that is a song you would like to do. Understanding of the CAGED chord system. 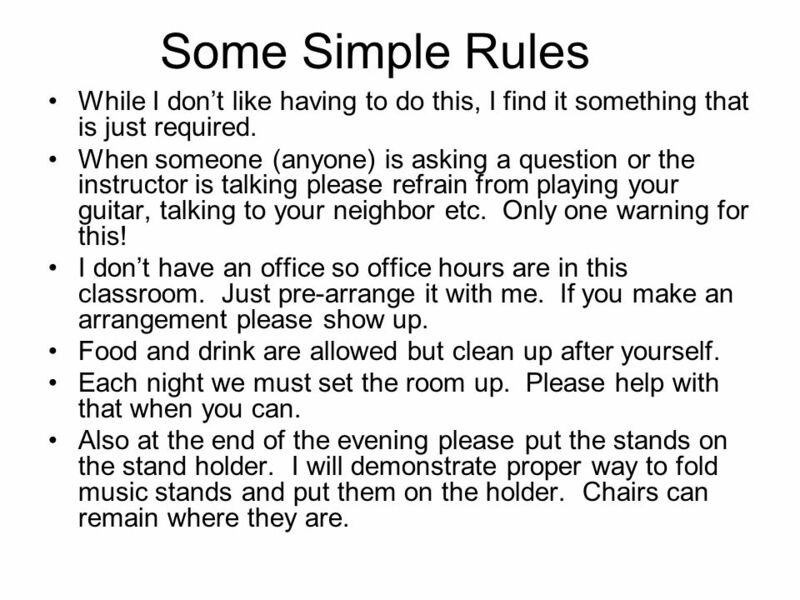 9 Some Simple Rules While I dont like having to do this, I find it something that is just required. When someone (anyone) is asking a question or the instructor is talking please refrain from playing your guitar, talking to your neighbor etc. Only one warning for this! I dont have an office so office hours are in this classroom. Just pre-arrange it with me. If you make an arrangement please show up. Food and drink are allowed but clean up after yourself. Each night we must set the room up. Please help with that when you can. Also at the end of the evening please put the stands on the stand holder. I will demonstrate proper way to fold music stands and put them on the holder. Chairs can remain where they are. 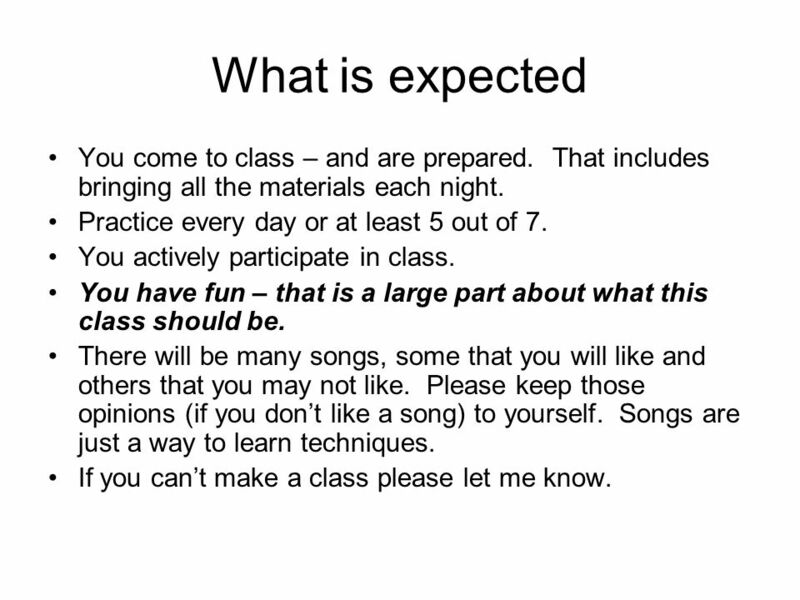 11 What is expected You come to class – and are prepared. That includes bringing all the materials each night. Practice every day or at least 5 out of 7. You actively participate in class. You have fun – that is a large part about what this class should be. There will be many songs, some that you will like and others that you may not like. Please keep those opinions (if you dont like a song) to yourself. Songs are just a way to learn techniques. If you cant make a class please let me know. 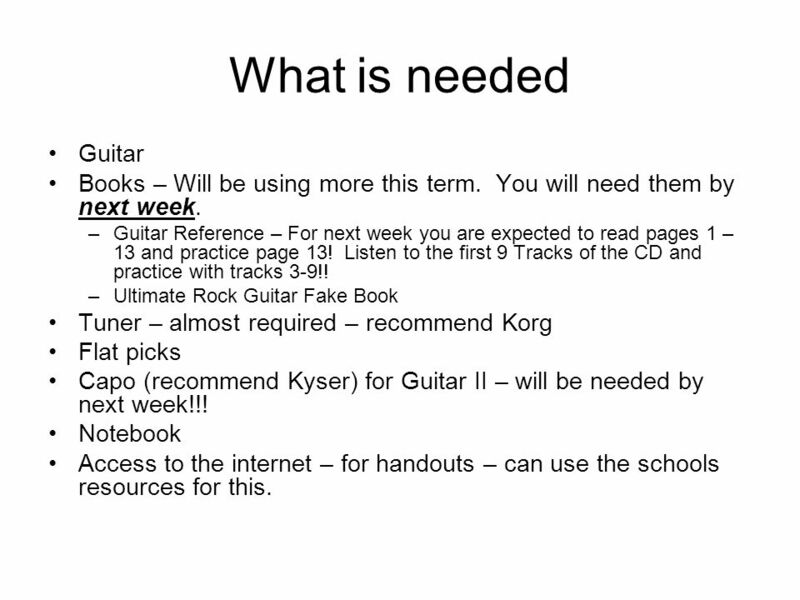 12 What is needed Guitar Books – Will be using more this term. You will need them by next week. 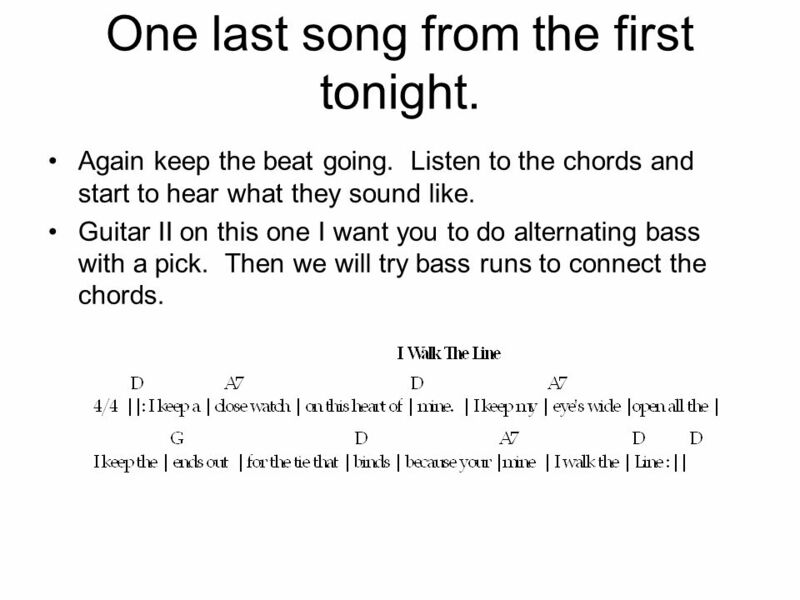 –Guitar Reference – For next week you are expected to read pages 1 – 13 and practice page 13! Listen to the first 9 Tracks of the CD and practice with tracks 3-9!! –Ultimate Rock Guitar Fake Book Tuner – almost required – recommend Korg Flat picks Capo (recommend Kyser) for Guitar II – will be needed by next week!!! Notebook Access to the internet – for handouts – can use the schools resources for this. 13 Outlines Next 2 pages Guitar I. 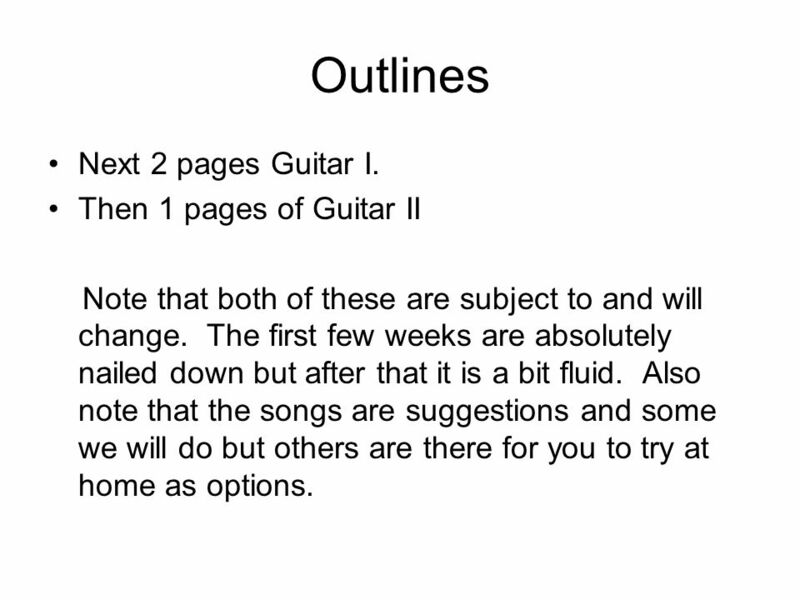 Then 1 pages of Guitar II Note that both of these are subject to and will change. The first few weeks are absolutely nailed down but after that it is a bit fluid. Also note that the songs are suggestions and some we will do but others are there for you to try at home as options. 17 For Guitar II during 1 st part tonight. 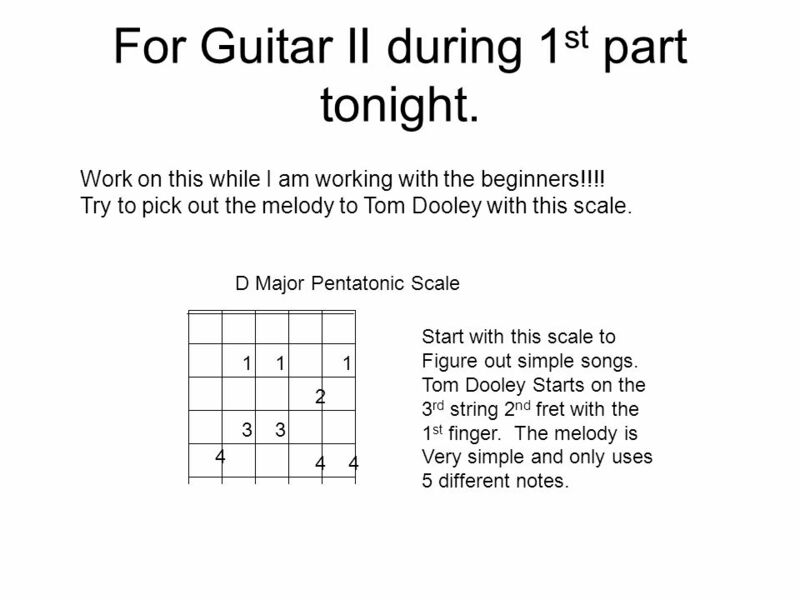 1 2 D Major Pentatonic Scale 11 3 Start with this scale to Figure out simple songs. Tom Dooley Starts on the 3 rd string 2 nd fret with the 1 st finger. The melody is Very simple and only uses 5 different notes. 3 4 44 Work on this while I am working with the beginners!!!! Try to pick out the melody to Tom Dooley with this scale. 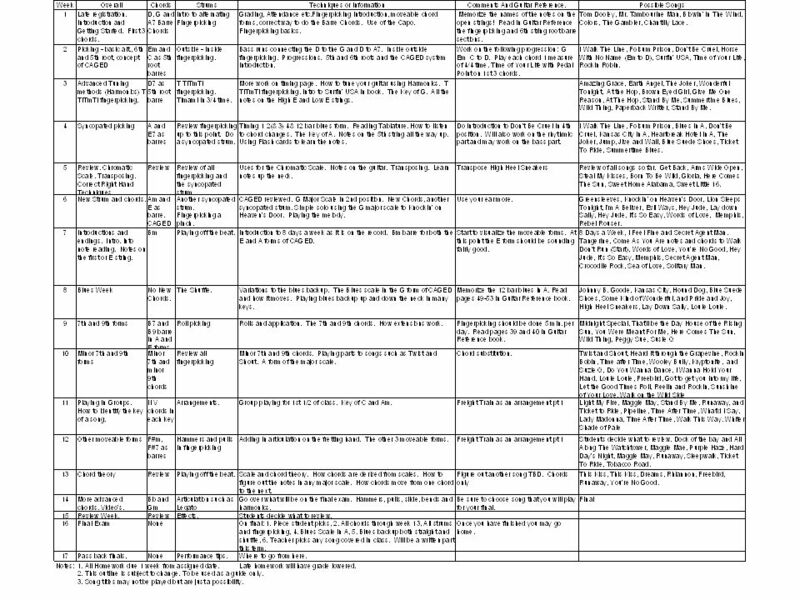 18 Parts of the guitar. 19 Holding the guitar. Hold the guitar in an upright position. Be sure to sit upright with your back straight. 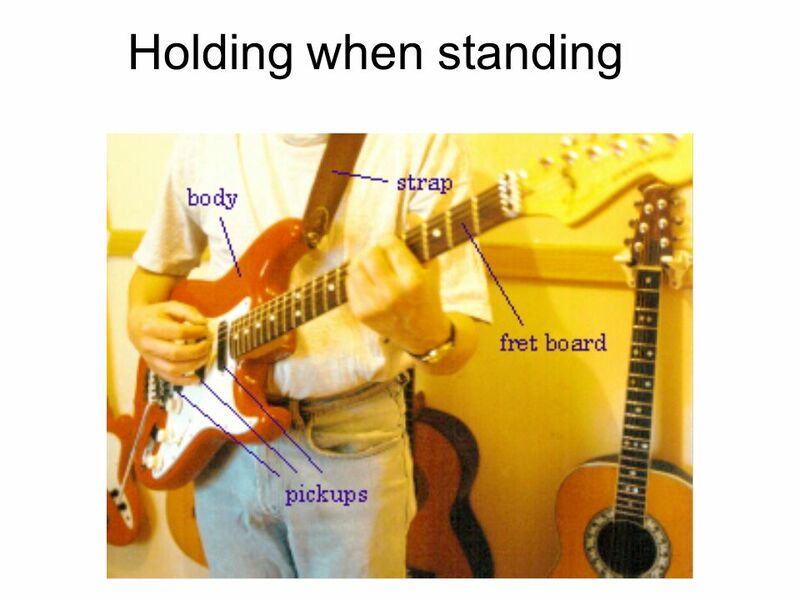 Hold the waist of the guitar on your leg. 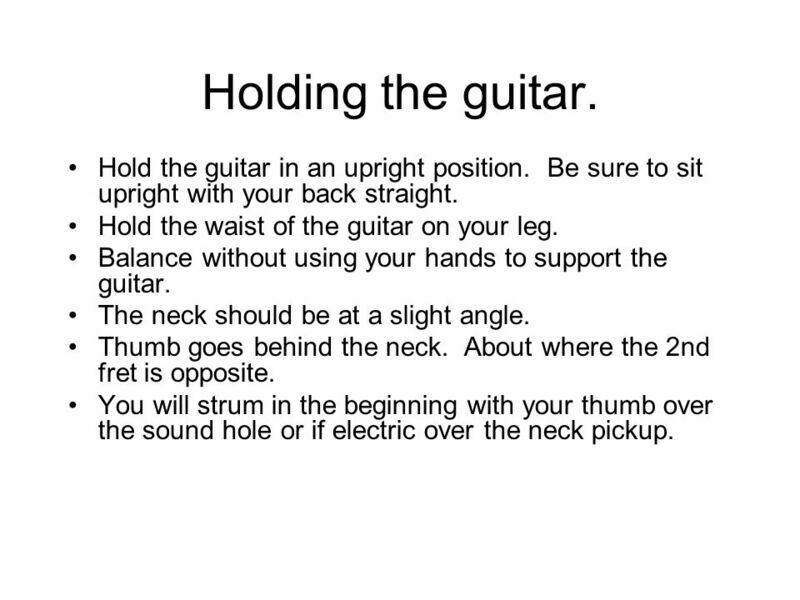 Balance without using your hands to support the guitar. The neck should be at a slight angle. Thumb goes behind the neck. About where the 2nd fret is opposite. You will strum in the beginning with your thumb over the sound hole or if electric over the neck pickup. 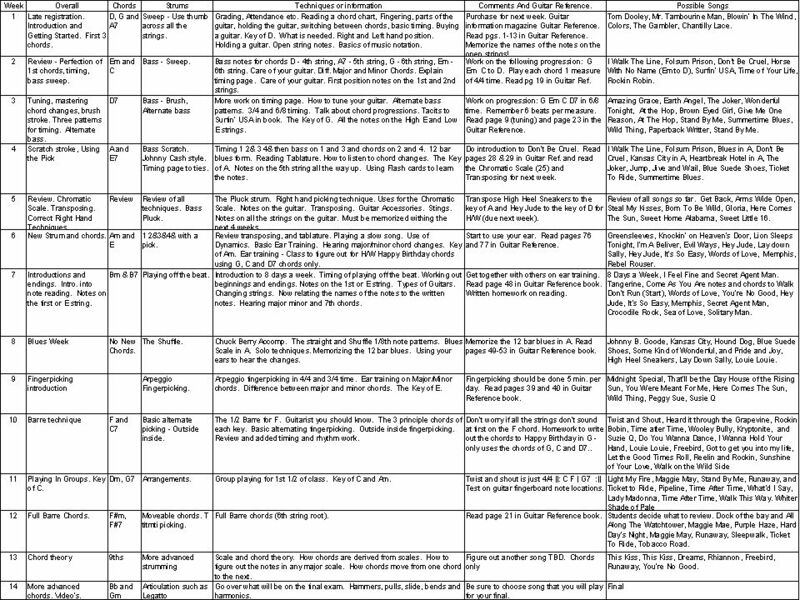 23 Names of the notes on the open strings. Name E A D G B E String 6 5 4 3 2 1 Below are the names of the notes on the open strings. These need to be memorized. 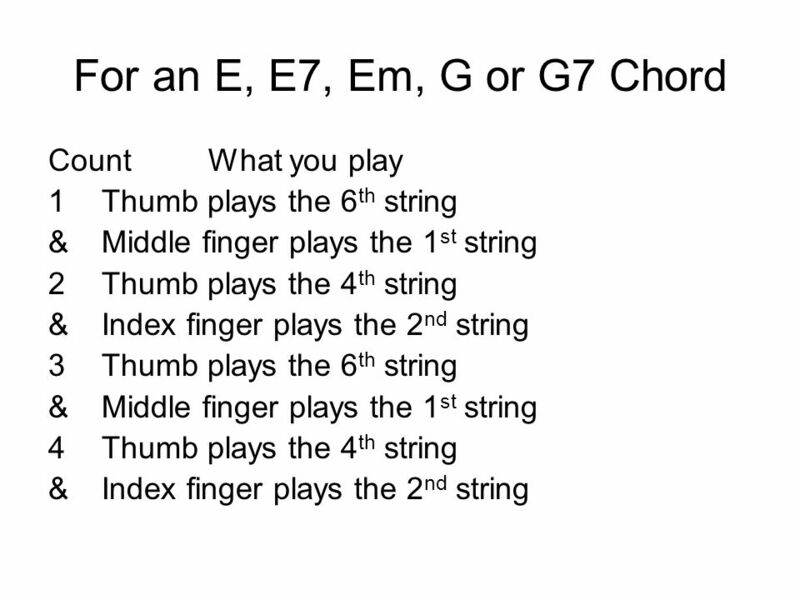 From the lowest pitch to the highest pitch: E, A, D, G, B and E. Note that the 6 th string is called low E and the 1 st string is called high E. We will have a quiz at some point on this. 24 Chords Definition: A chord is a combination of at least three different notes (letter names) that sound pleasing to the ear. 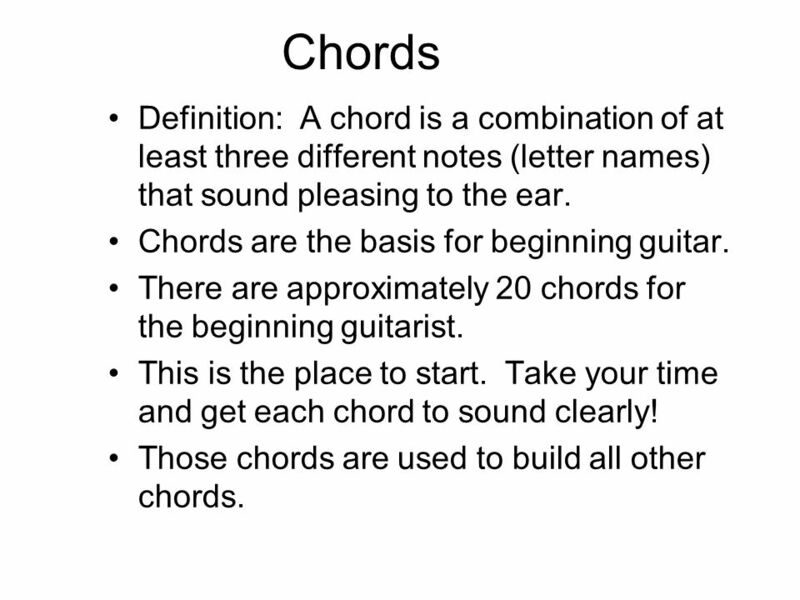 Chords are the basis for beginning guitar. There are approximately 20 chords for the beginning guitarist. This is the place to start. Take your time and get each chord to sound clearly! Those chords are used to build all other chords. 25 How to read a chord diagram. 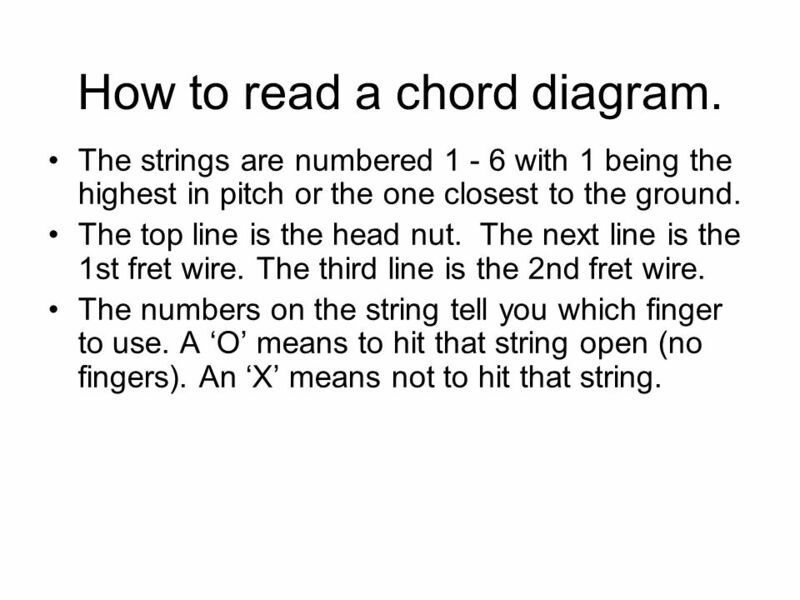 The strings are numbered 1 - 6 with 1 being the highest in pitch or the one closest to the ground. The top line is the head nut. The next line is the 1st fret wire. The third line is the 2nd fret wire. The numbers on the string tell you which finger to use. A O means to hit that string open (no fingers). An X means not to hit that string. 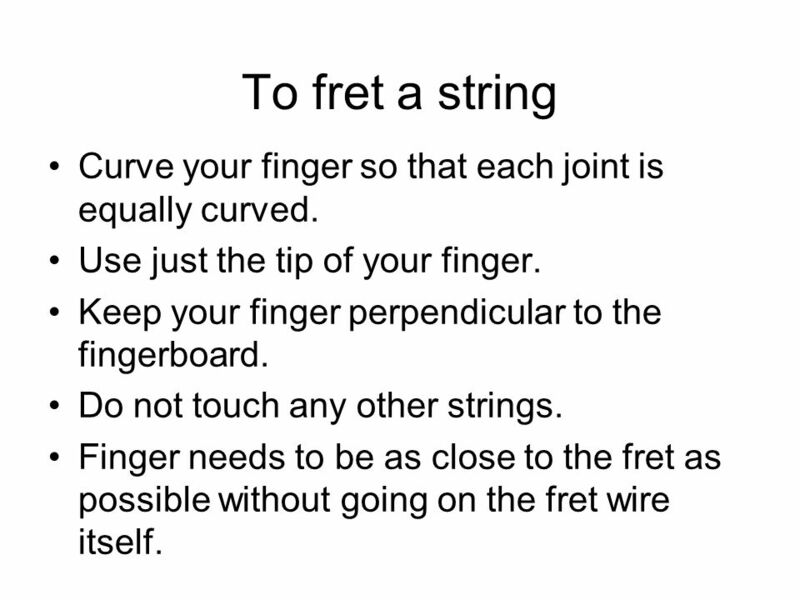 26 To fret a string Curve your finger so that each joint is equally curved. Use just the tip of your finger. 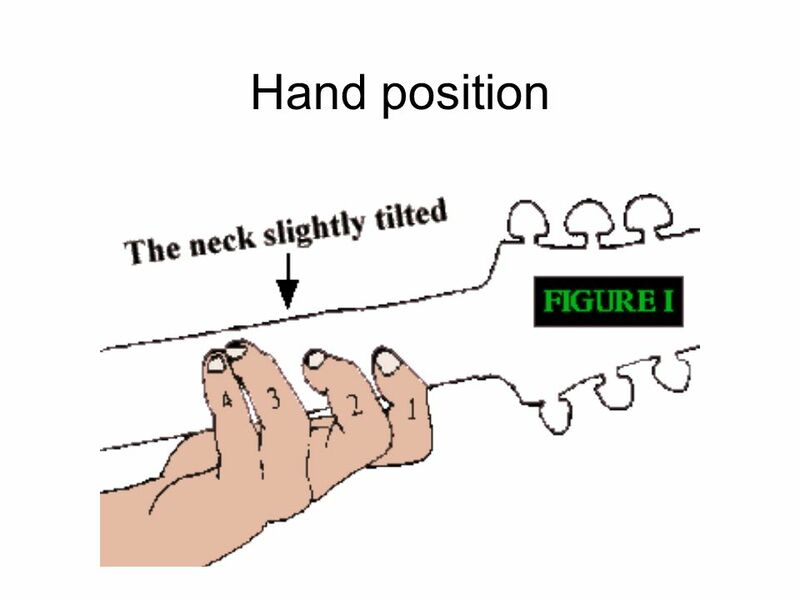 Keep your finger perpendicular to the fingerboard. Do not touch any other strings. Finger needs to be as close to the fret as possible without going on the fret wire itself. 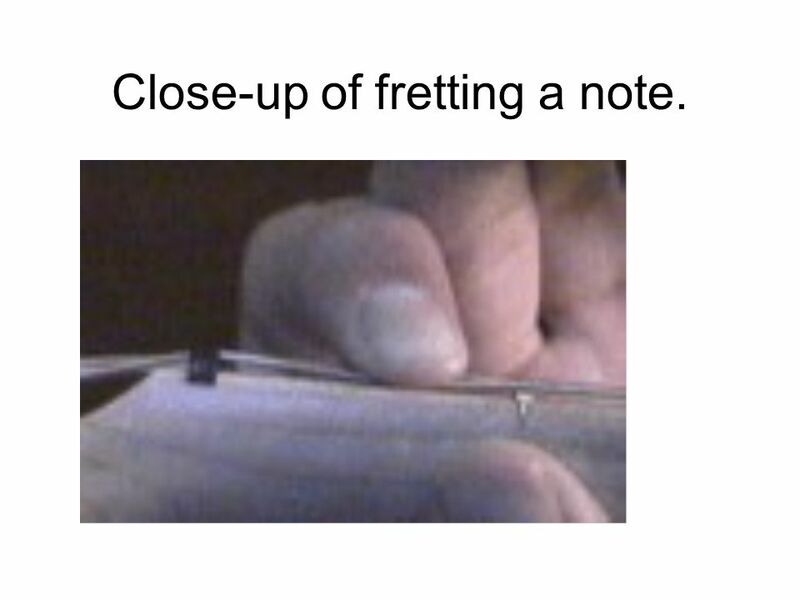 27 Close-up of fretting a note. 28 Timing To start we will play in 4/4 time. The top number of the time signature tells us that there are 4 counts or beats per measure. A measure is the distance between the vertical lines on staff (the 5 lines and 4 spaces that music is written on. Strum with your thumb over the sound hole or if electric over the neck pickup. There are really only 2 basic timing patterns a 2 pattern and a 3 pattern. All others are built off of those two or combinations of those 2 patterns. 30 Strumming the chord To start strum with just your thumb in a downward motion. Play over the sound hole. This is called a sweep. Try to hit the strings quickly. Ideally all at one time. Use your wrist. 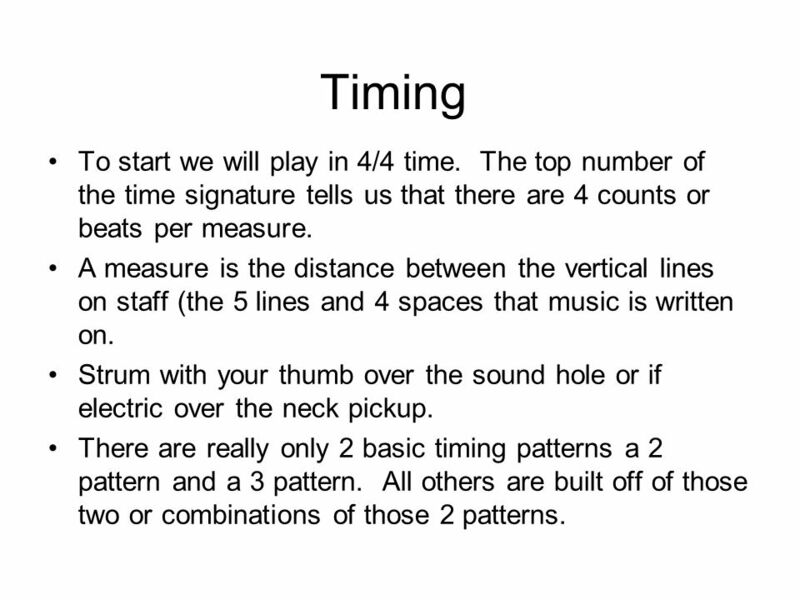 We will play in 4/4 time which means that there are four counts per measure. A measure being the distance between bar lines (vertical lines on the staff). 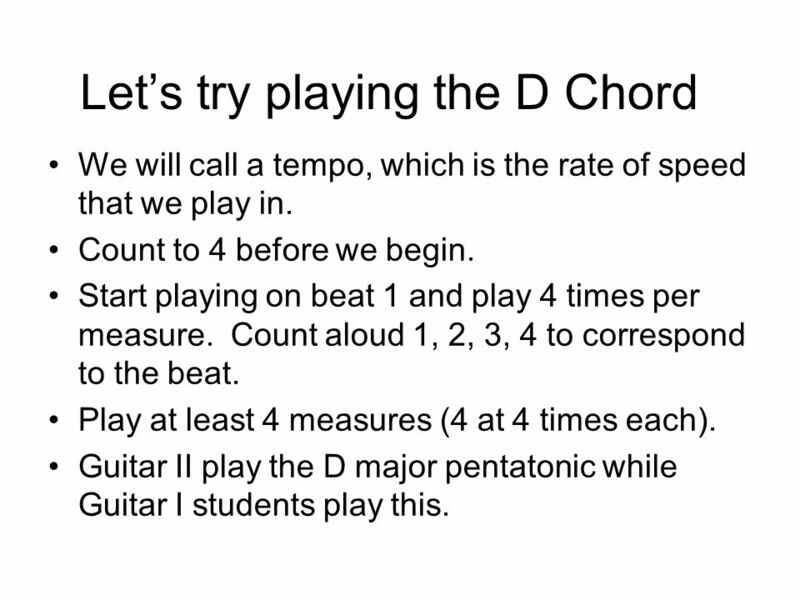 31 Lets try playing the D Chord We will call a tempo, which is the rate of speed that we play in. Count to 4 before we begin. Start playing on beat 1 and play 4 times per measure. Count aloud 1, 2, 3, 4 to correspond to the beat. Play at least 4 measures (4 at 4 times each). Guitar II play the D major pentatonic while Guitar I students play this. 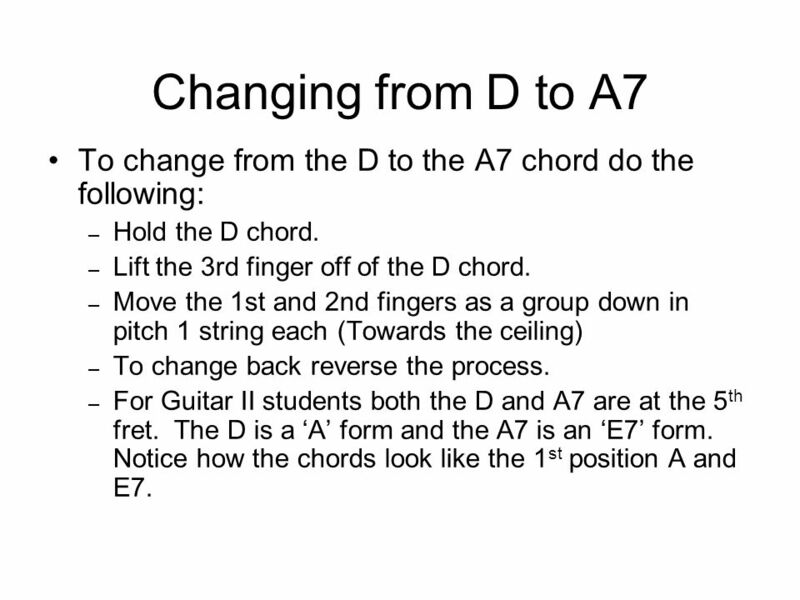 33 Changing from D to A7 To change from the D to the A7 chord do the following: – Hold the D chord. – Lift the 3rd finger off of the D chord. – Move the 1st and 2nd fingers as a group down in pitch 1 string each (Towards the ceiling) – To change back reverse the process. 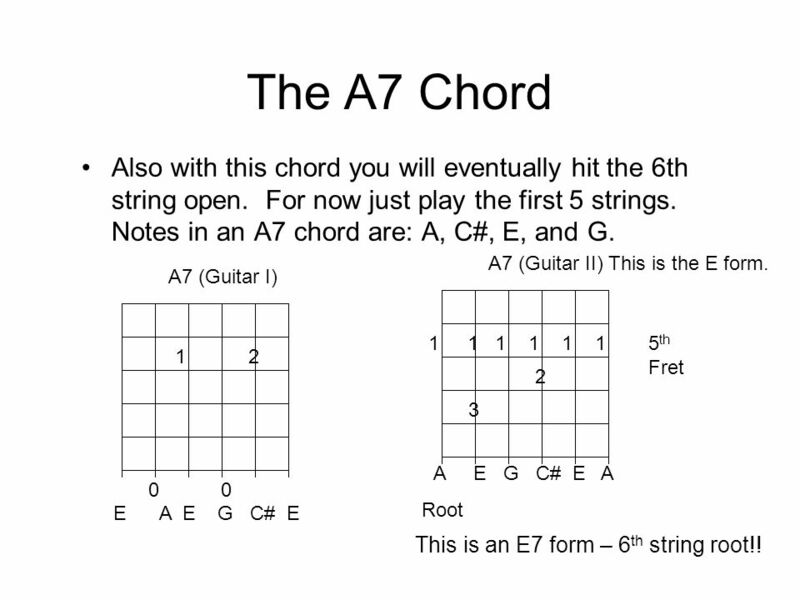 – For Guitar II students both the D and A7 are at the 5 th fret. The D is a A form and the A7 is an E7 form. Notice how the chords look like the 1 st position A and E7. 34 Lets try it!! 4/4 ||: D | | | |A7 | | | :|| (repeat) (Remember to count while you play!) 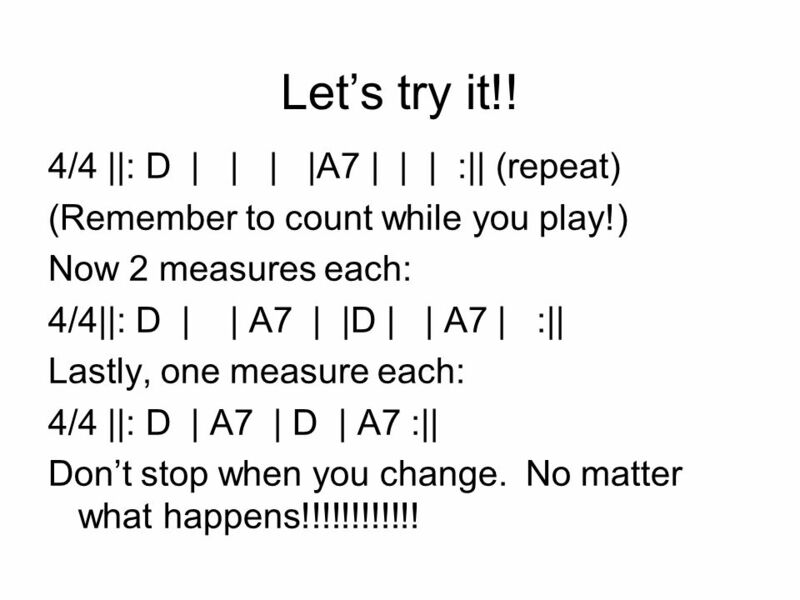 Now 2 measures each: 4/4||: D | | A7 | |D | | A7 | :|| Lastly, one measure each: 4/4 ||: D | A7 | D | A7 :|| Dont stop when you change. No matter what happens!!!!!!!!!!!! 35 How about trying a simple song. 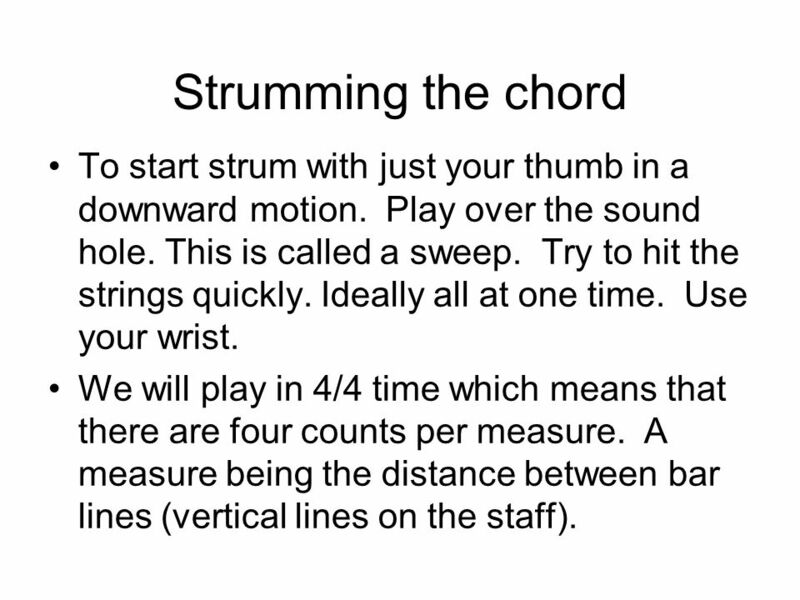 Remember to play 4 strums or beats per measure. Count to 4 to give the tempo before you begin playing. Keep it even and dont stop for anything. 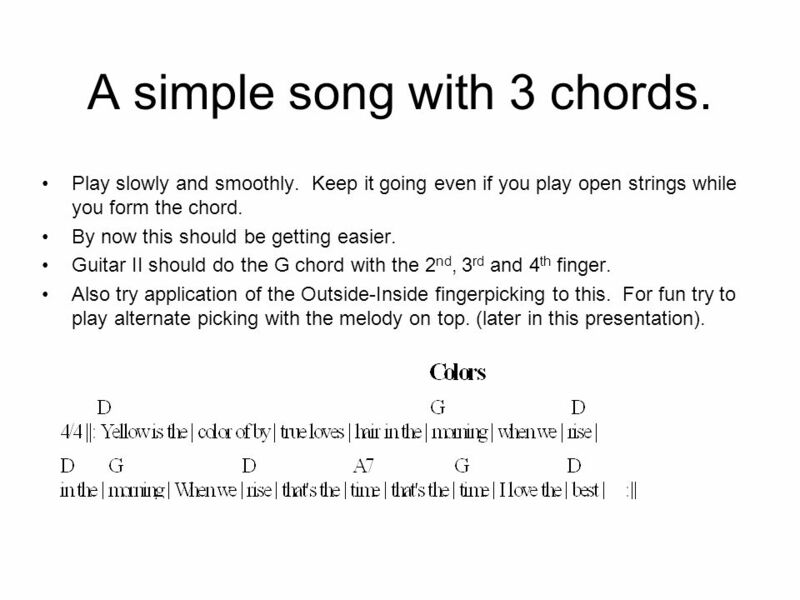 For Guitar II – Try to learn the melody. The notes are all on the 1 st 3 strings in 2 nd position. All are within the D major Pentatonic Scale. The starting note is an A on the 3 rd string 2 nd fret. You should go back and forth between the melody and the chords! A large part of this term should be to master the material learned previously!! 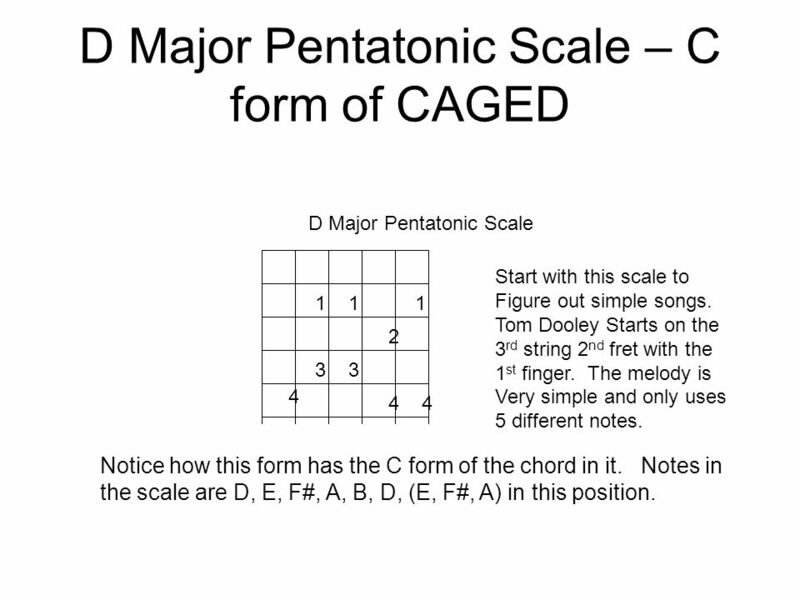 36 D Major Pentatonic Scale – C form of CAGED 1 2 D Major Pentatonic Scale 11 3 Start with this scale to Figure out simple songs. Tom Dooley Starts on the 3 rd string 2 nd fret with the 1 st finger. The melody is Very simple and only uses 5 different notes. 3 4 44 Notice how this form has the C form of the chord in it. Notes in the scale are D, E, F#, A, B, D, (E, F#, A) in this position. 37 1 2 11 33 4 44 Do you see it now! 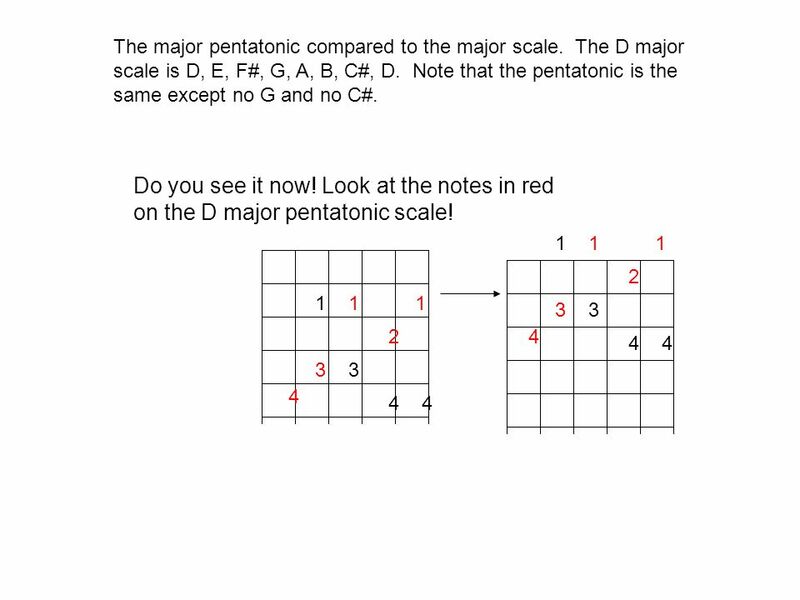 Look at the notes in red on the D major pentatonic scale! 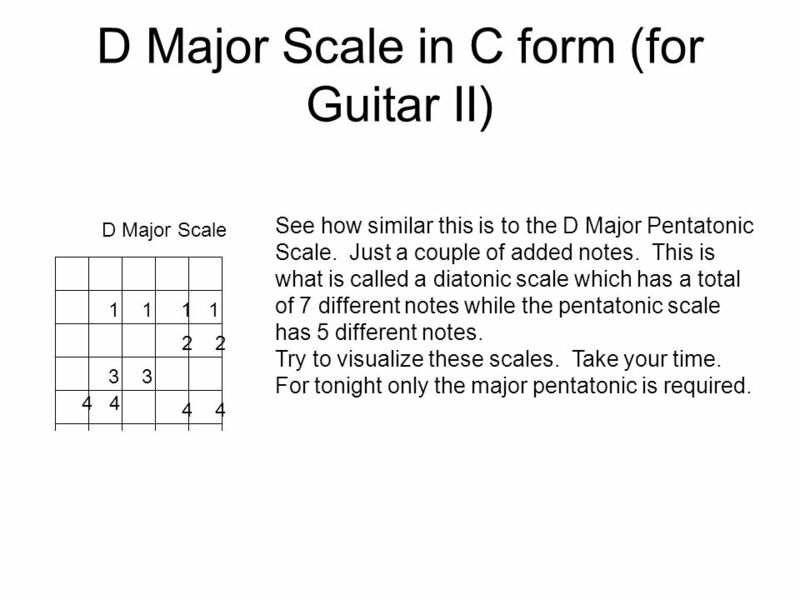 1 2 11 33 4 44 The major pentatonic compared to the major scale. The D major scale is D, E, F#, G, A, B, C#, D. Note that the pentatonic is the same except no G and no C#. 39 A simple song with 3 chords. Play slowly and smoothly. Keep it going even if you play open strings while you form the chord. By now this should be getting easier. Guitar II should do the G chord with the 2 nd, 3 rd and 4 th finger. Also try application of the Outside-Inside fingerpicking to this. For fun try to play alternate picking with the melody on top. (later in this presentation). 41 D Major Scale in C form (for Guitar II) 1 2 D Major Scale 11 33 4 44 See how similar this is to the D Major Pentatonic Scale. Just a couple of added notes. This is what is called a diatonic scale which has a total of 7 different notes while the pentatonic scale has 5 different notes. Try to visualize these scales. Take your time. For tonight only the major pentatonic is required. 42 Lets try a little harder song using all 3 chords. Dont stop for anything. Play slowly and smoothly. Count aloud while you play. Play slowly and start the change on the last beat of the measure. Take your time when practicing at home. Play this very slowly and deliberately. 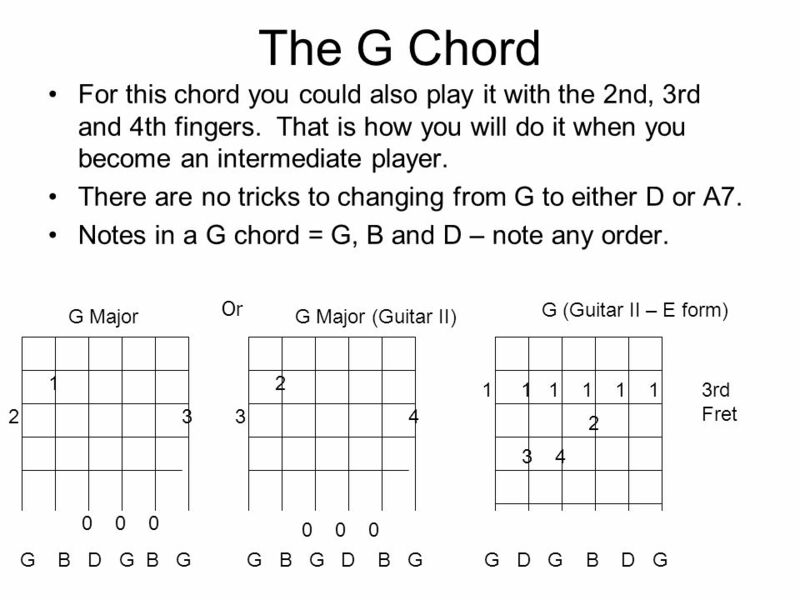 Again guitar II learn melody – The notes in the G chord are G, B and D. The starting note is one of those. To help it is on the 2 nd or B string. 2 nd String open is B, 2 nd string 1 st fret is C and 3 rd fret is D.
43 One last song from the first tonight. Again keep the beat going. Listen to the chords and start to hear what they sound like. Guitar II on this one I want you to do alternating bass with a pick. 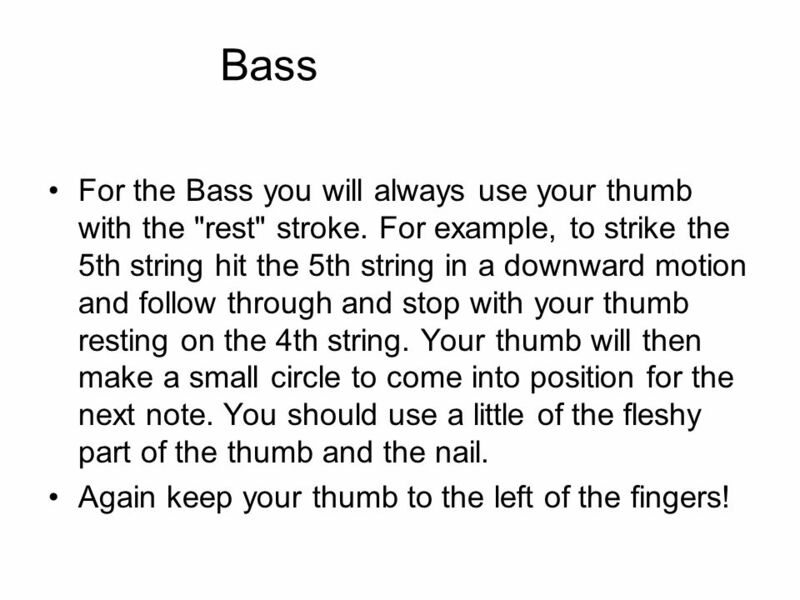 Then we will try bass runs to connect the chords. 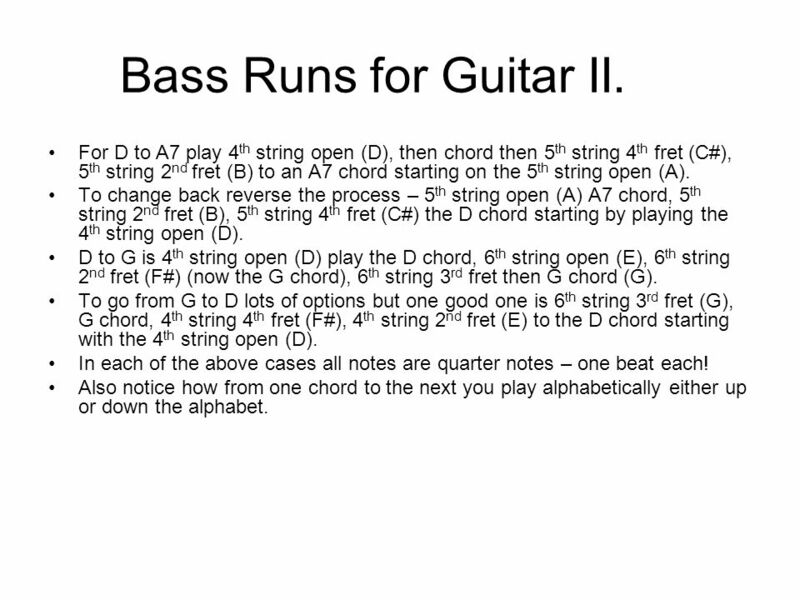 44 Bass Runs for Guitar II. 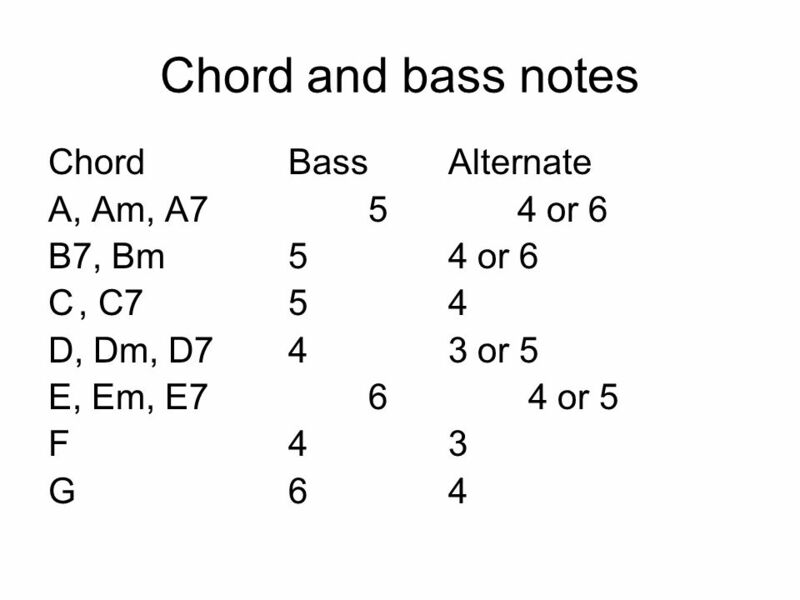 For D to A7 play 4 th string open (D), then chord then 5 th string 4 th fret (C#), 5 th string 2 nd fret (B) to an A7 chord starting on the 5 th string open (A). To change back reverse the process – 5 th string open (A) A7 chord, 5 th string 2 nd fret (B), 5 th string 4 th fret (C#) the D chord starting by playing the 4 th string open (D). 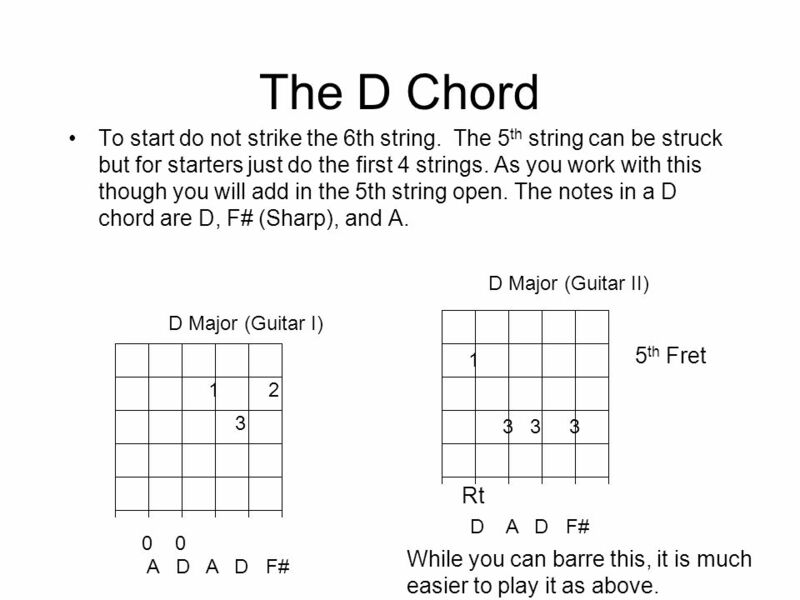 D to G is 4 th string open (D) play the D chord, 6 th string open (E), 6 th string 2 nd fret (F#) (now the G chord), 6 th string 3 rd fret then G chord (G). To go from G to D lots of options but one good one is 6 th string 3 rd fret (G), G chord, 4 th string 4 th fret (F#), 4 th string 2 nd fret (E) to the D chord starting with the 4 th string open (D). In each of the above cases all notes are quarter notes – one beat each! 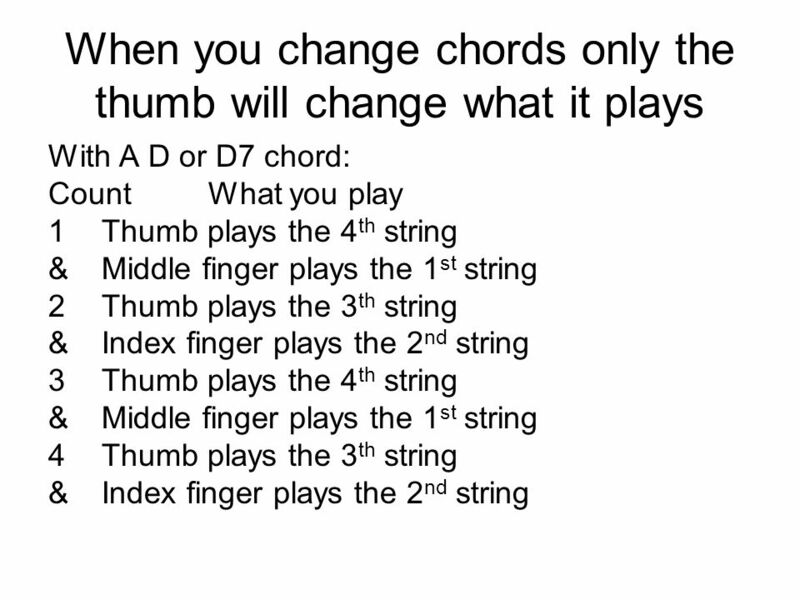 Also notice how from one chord to the next you play alphabetically either up or down the alphabet. 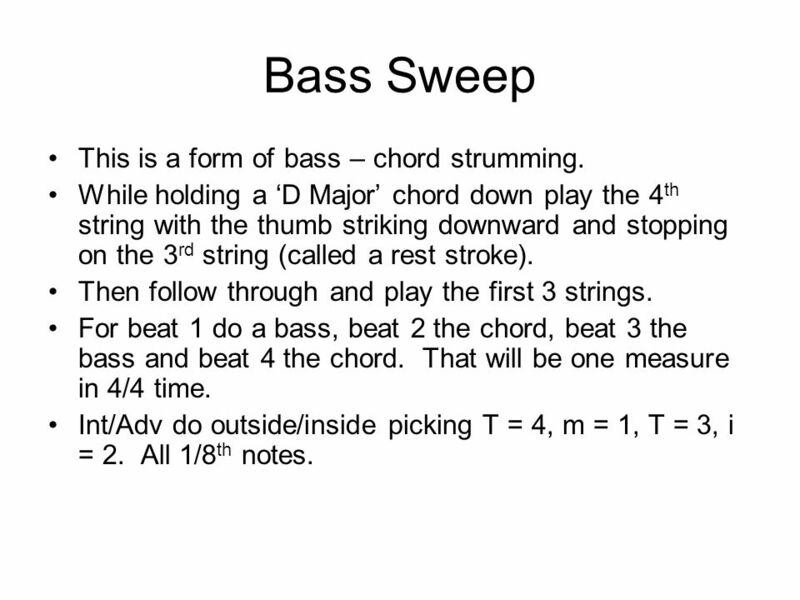 45 Bass Sweep This is a form of bass – chord strumming. While holding a D Major chord down play the 4 th string with the thumb striking downward and stopping on the 3 rd string (called a rest stroke). Then follow through and play the first 3 strings. For beat 1 do a bass, beat 2 the chord, beat 3 the bass and beat 4 the chord. That will be one measure in 4/4 time. Int/Adv do outside/inside picking T = 4, m = 1, T = 3, i = 2. All 1/8 th notes. 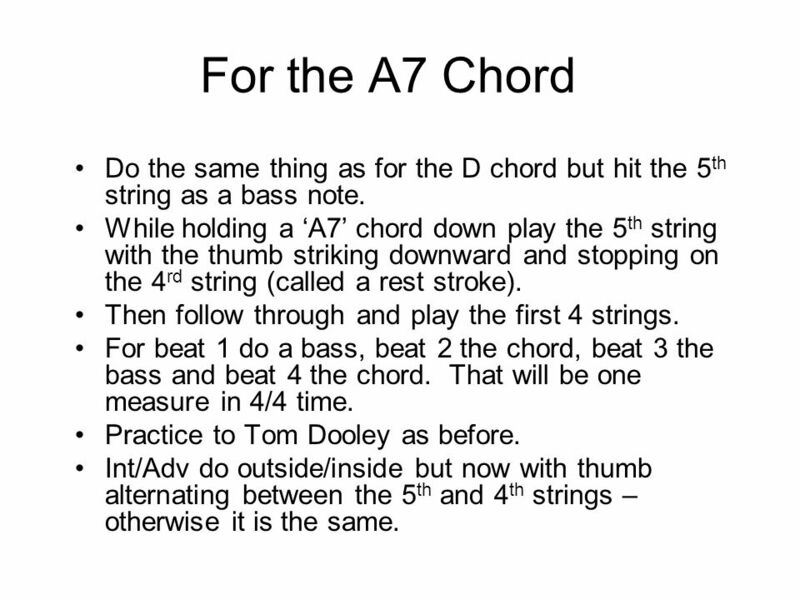 46 For the A7 Chord Do the same thing as for the D chord but hit the 5 th string as a bass note. While holding a A7 chord down play the 5 th string with the thumb striking downward and stopping on the 4 rd string (called a rest stroke). Then follow through and play the first 4 strings. For beat 1 do a bass, beat 2 the chord, beat 3 the bass and beat 4 the chord. That will be one measure in 4/4 time. 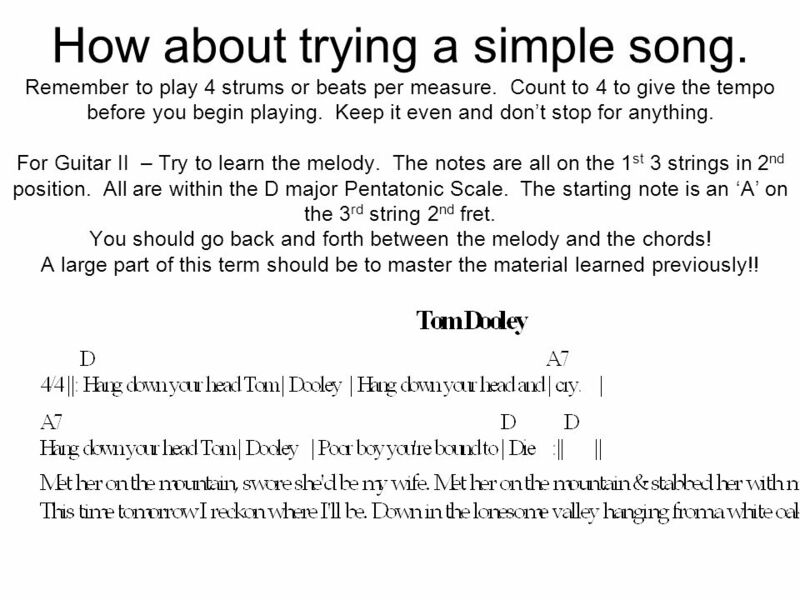 Practice to Tom Dooley as before. Int/Adv do outside/inside but now with thumb alternating between the 5 th and 4 th strings – otherwise it is the same. 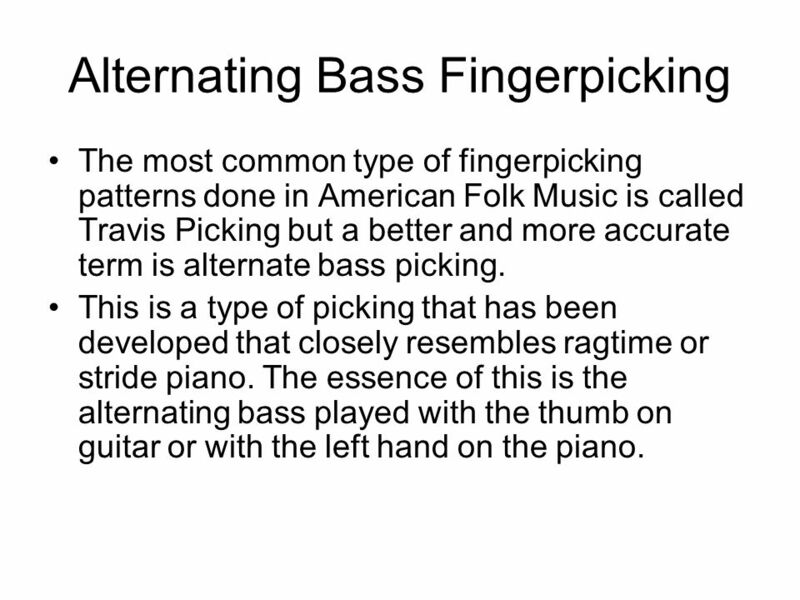 48 Alternating Bass Fingerpicking The most common type of fingerpicking patterns done in American Folk Music is called Travis Picking but a better and more accurate term is alternate bass picking. This is a type of picking that has been developed that closely resembles ragtime or stride piano. The essence of this is the alternating bass played with the thumb on guitar or with the left hand on the piano. 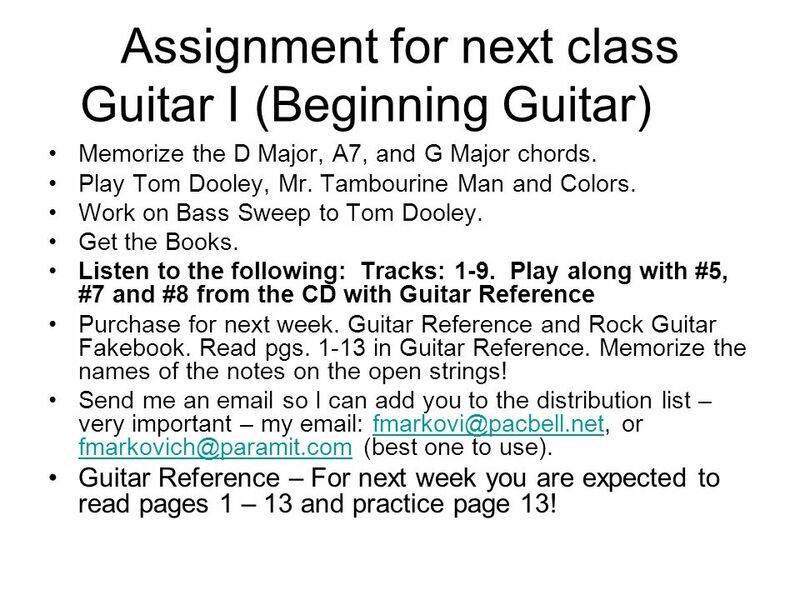 49 Assignment for next class Guitar I (Beginning Guitar) Memorize the D Major, A7, and G Major chords. Play Tom Dooley, Mr. Tambourine Man and Colors. Work on Bass Sweep to Tom Dooley. Get the Books. Listen to the following: Tracks: 1-9. Play along with #5, #7 and #8 from the CD with Guitar Reference Purchase for next week. Guitar Reference and Rock Guitar Fakebook. Read pgs. 1-13 in Guitar Reference. 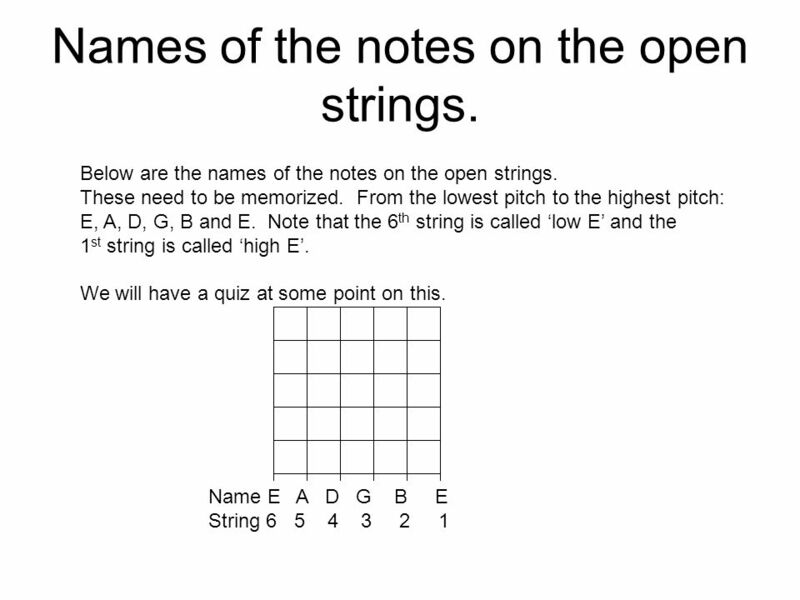 Memorize the names of the notes on the open strings! Send me an email so I can add you to the distribution list – very important – my email: fmarkovi@pacbell.net, or fmarkovich@paramit.com (best one to use).fmarkovi@pacbell.net fmarkovich@paramit.com Guitar Reference – For next week you are expected to read pages 1 – 13 and practice page 13! 51 Listen to compositions by such people as Scott Joplin to get an idea of where this style came from. First with pattern picking and then with specific arrangements. Such players as Leo Kottke, Doc Watson, Chet Atkins, Paul McCartney, Jimmy Page and others use this style. Listen to them to get a feel for what you should be doing. In addition to alternating bass patterns another common pattern type that is done is "arpeggio" styles or "broken chord" patterns. You must listen!! 52 Picking hand position Your fingers should all be curved at each joint. 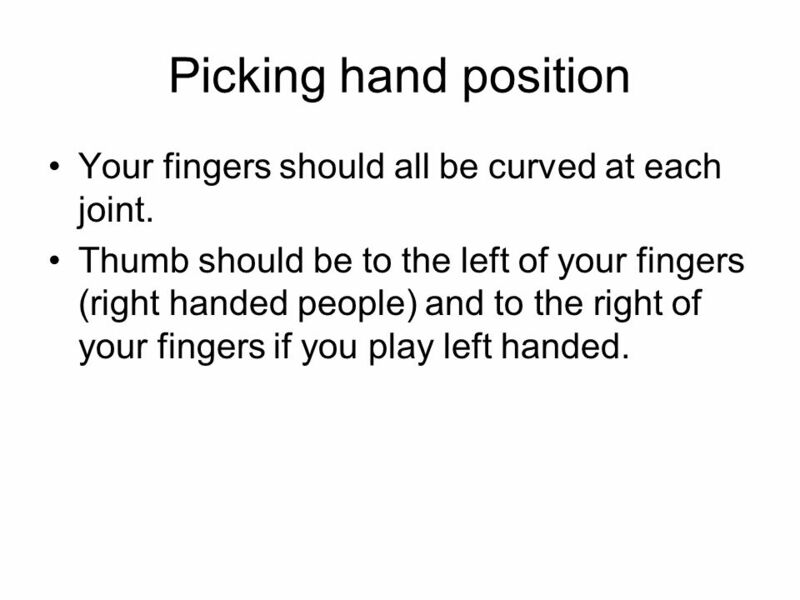 Thumb should be to the left of your fingers (right handed people) and to the right of your fingers if you play left handed. 53 Thumb The thumb will do the rest stroke on most American styles of finger-picking. 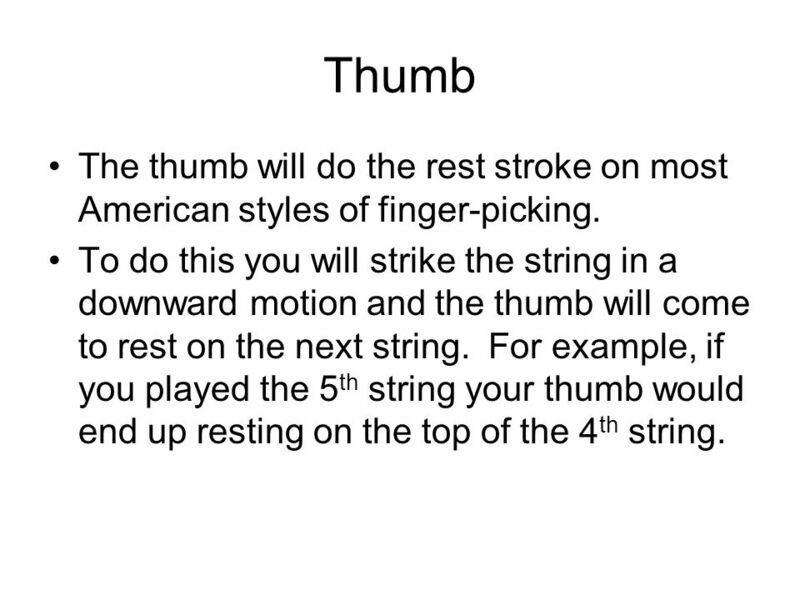 To do this you will strike the string in a downward motion and the thumb will come to rest on the next string. For example, if you played the 5 th string your thumb would end up resting on the top of the 4 th string. 56 Keep the pattern going The bass notes change as you change chords while the strings played with the first and second fingers many times remain the same. 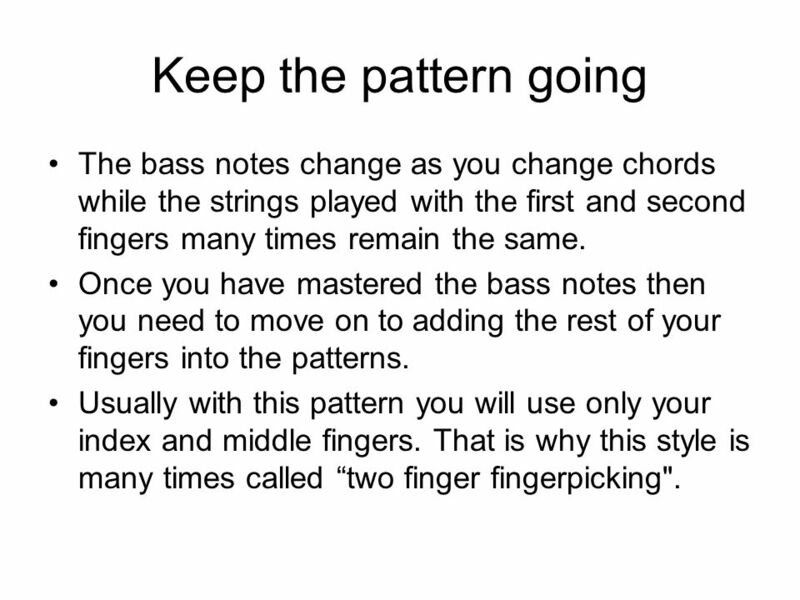 Once you have mastered the bass notes then you need to move on to adding the rest of your fingers into the patterns. Usually with this pattern you will use only your index and middle fingers. That is why this style is many times called two finger fingerpicking". 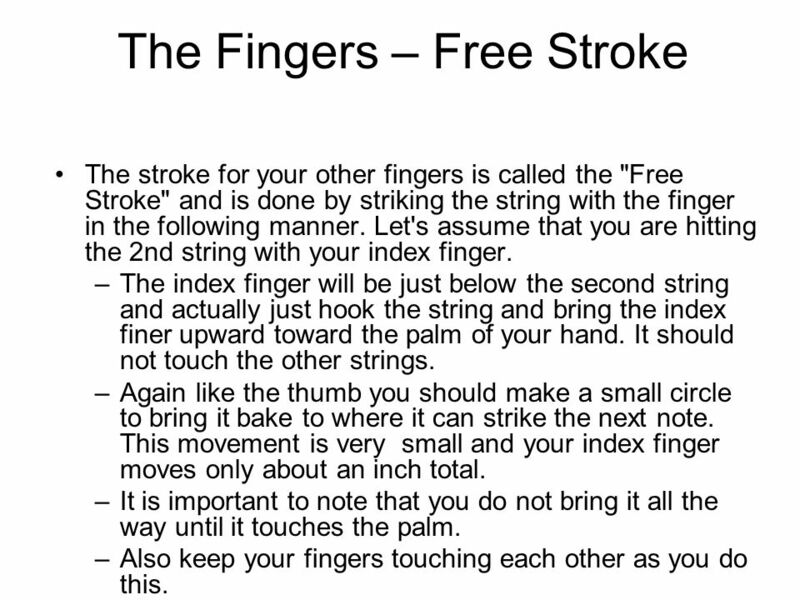 58 The Fingers – Free Stroke The stroke for your other fingers is called the "Free Stroke" and is done by striking the string with the finger in the following manner. 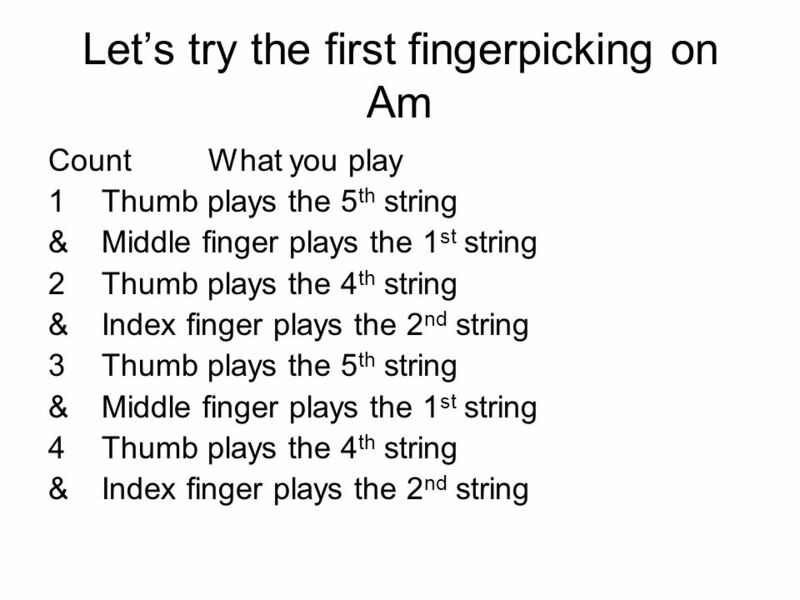 Let's assume that you are hitting the 2nd string with your index finger. –The index finger will be just below the second string and actually just hook the string and bring the index finer upward toward the palm of your hand. It should not touch the other strings. –Again like the thumb you should make a small circle to bring it bake to where it can strike the next note. This movement is very small and your index finger moves only about an inch total. –It is important to note that you do not bring it all the way until it touches the palm. –Also keep your fingers touching each other as you do this. 62 Learn the chords before applying the fingerpicking You need to know the chords first. Then the fingerpicking. Dont try until both can be done separately. 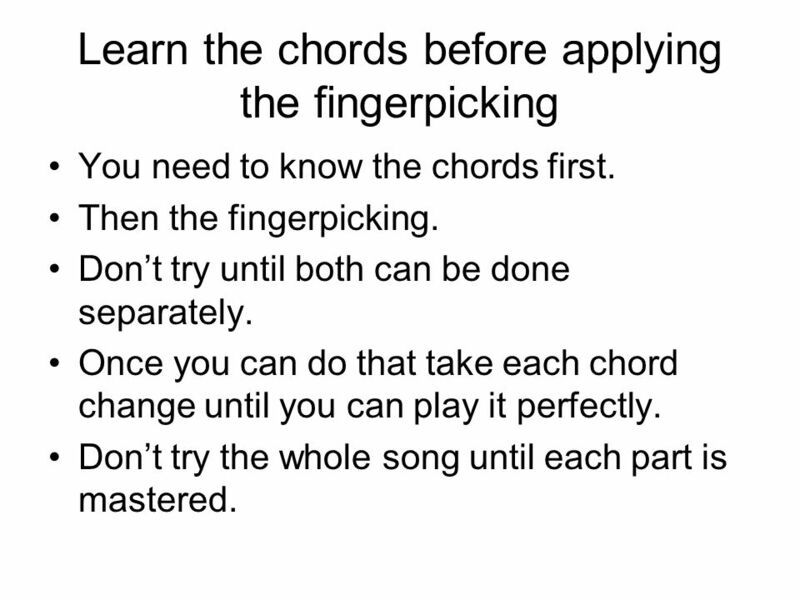 Once you can do that take each chord change until you can play it perfectly. Dont try the whole song until each part is mastered. 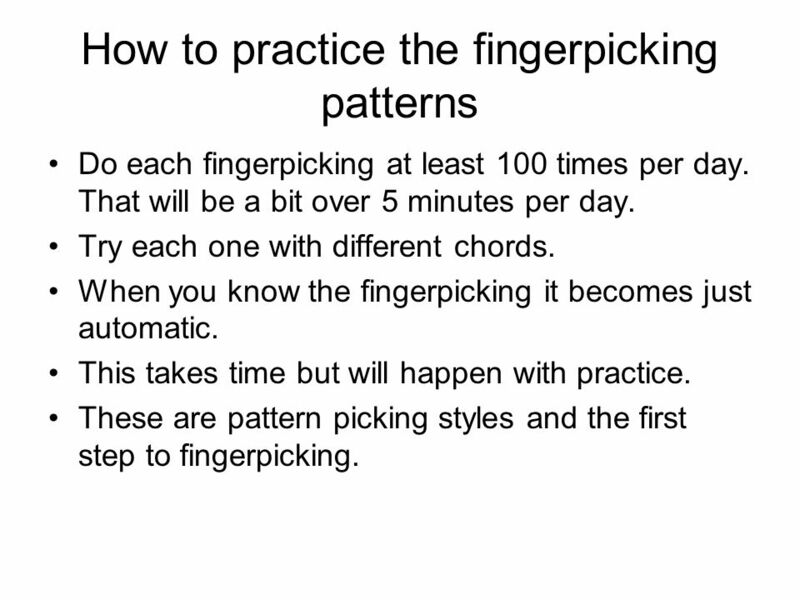 63 How to practice the fingerpicking patterns Do each fingerpicking at least 100 times per day. That will be a bit over 5 minutes per day. 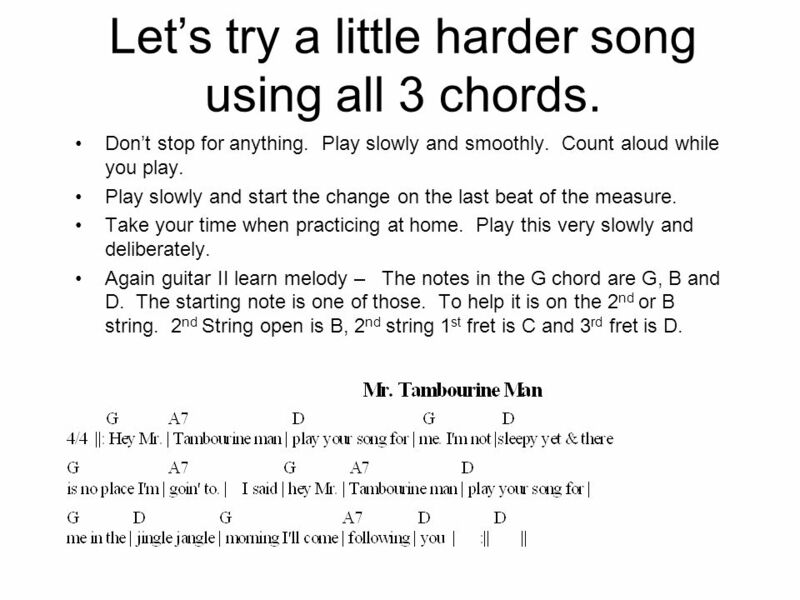 Try each one with different chords. When you know the fingerpicking it becomes just automatic. This takes time but will happen with practice. 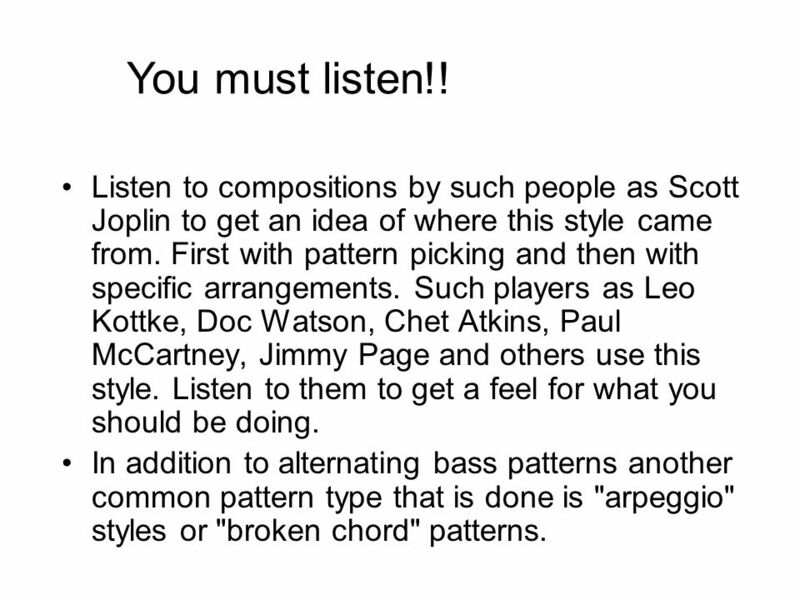 These are pattern picking styles and the first step to fingerpicking. 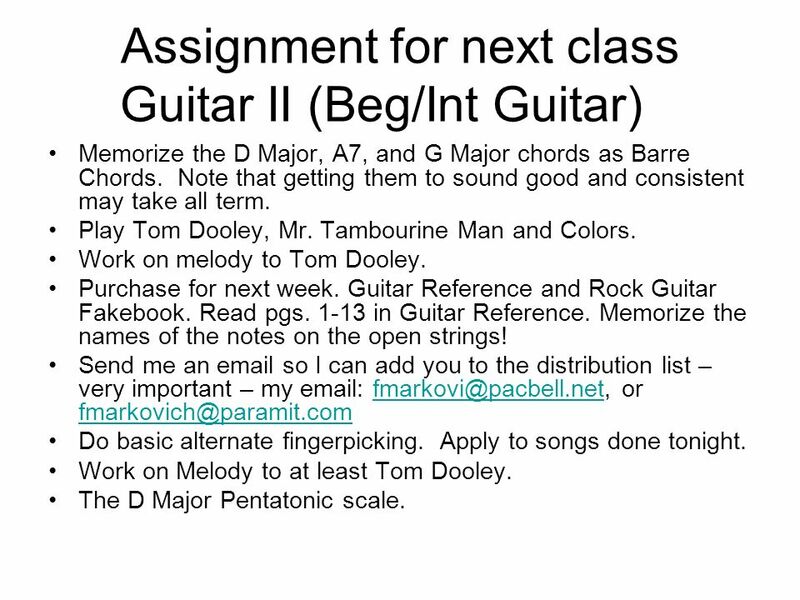 64 Assignment for next class Guitar II (Beg/Int Guitar) Memorize the D Major, A7, and G Major chords as Barre Chords. Note that getting them to sound good and consistent may take all term. Play Tom Dooley, Mr. Tambourine Man and Colors. Work on melody to Tom Dooley. Purchase for next week. Guitar Reference and Rock Guitar Fakebook. Read pgs. 1-13 in Guitar Reference. Memorize the names of the notes on the open strings! 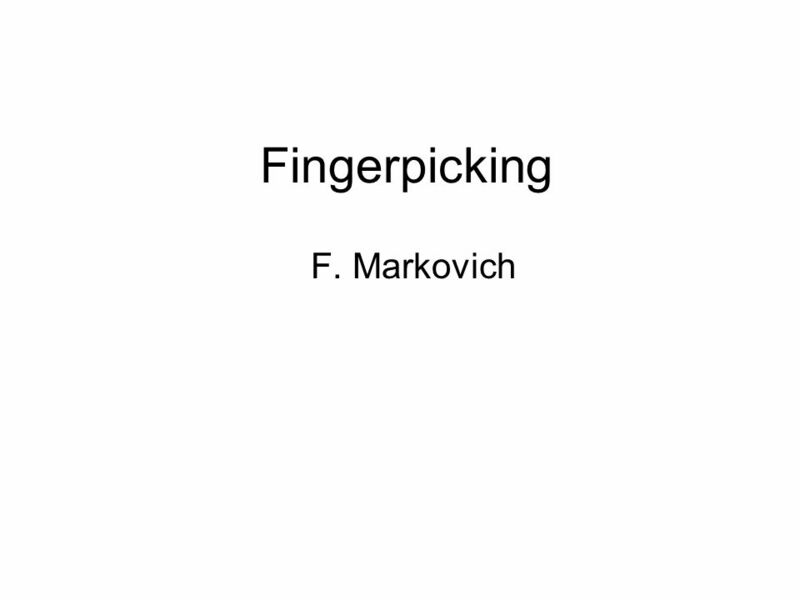 Send me an email so I can add you to the distribution list – very important – my email: fmarkovi@pacbell.net, or fmarkovich@paramit.comfmarkovi@pacbell.net fmarkovich@paramit.com Do basic alternate fingerpicking. Apply to songs done tonight. Work on Melody to at least Tom Dooley. The D Major Pentatonic scale. Download ppt "Guitar I and Guitar II Spring 2005 Class 1 Music 377 Guitar I, Beginning Guitar and Music 378 Guitar II (Beg/Int) Instructor: Frank Markovich Web to pick." Guitar I and Guitar II Spring 2006 Class 1 Music 377 Guitar I, Beginning Guitar and Music 378 Guitar II (Beg/Int) Instructor: Frank Markovich Web to pick. Class 7 Guitar I, & II Slow Song Accessories Chromatic Scale Bass Pluck Strum More timing work (Maybe) Finish fingerpicking 1 st pattern. Some review and. Guitar I and Guitar II Class 15 Review first only!!! After review I may do more but none of that will be on the final. 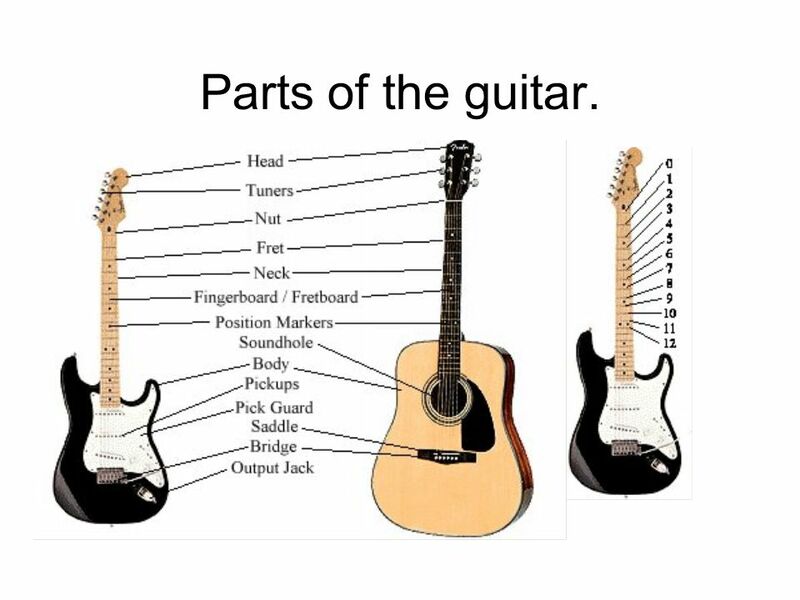 Tuning Your Guitar. Key is to match pitches. 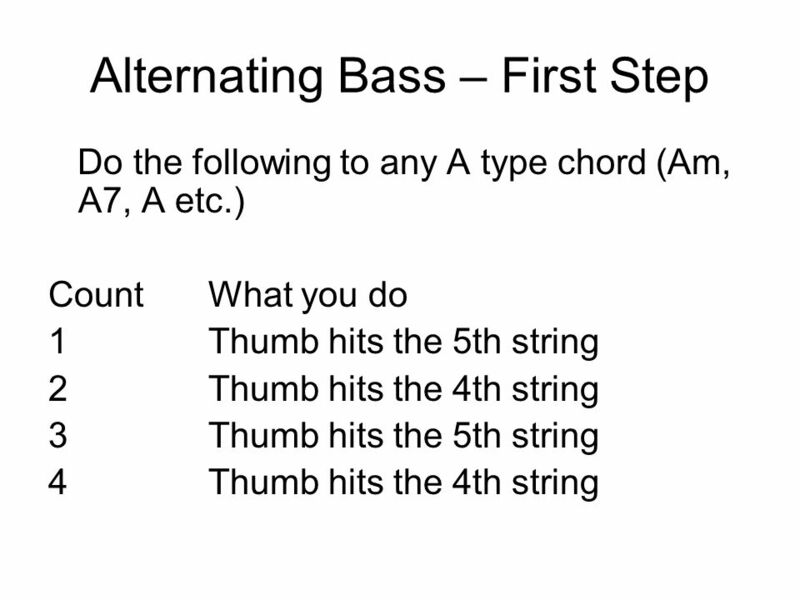 Easiest way is as follows: –Tune 1 st string to a reference. –Tune 2 nd string by playing 5 th fret 2 nd. MRS. MOTT’S ALGEBRA FOUNDATIONS CLASSROOM PROCEDURES. This is both the Beatles and the Isley Brothers.